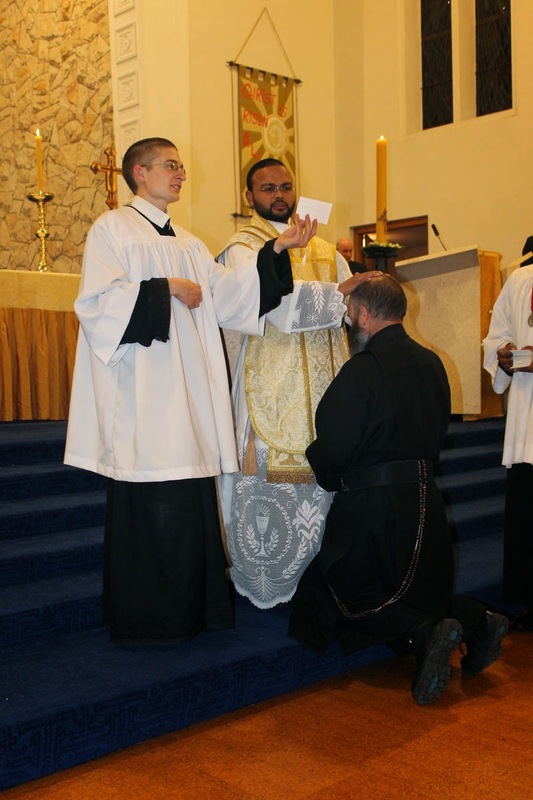 Ordination of Rev Fr Jean Marie, F.SS.R. 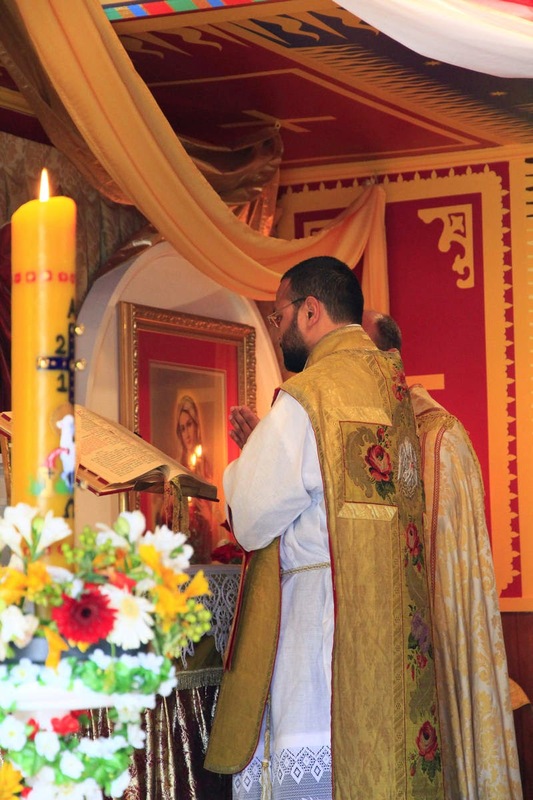 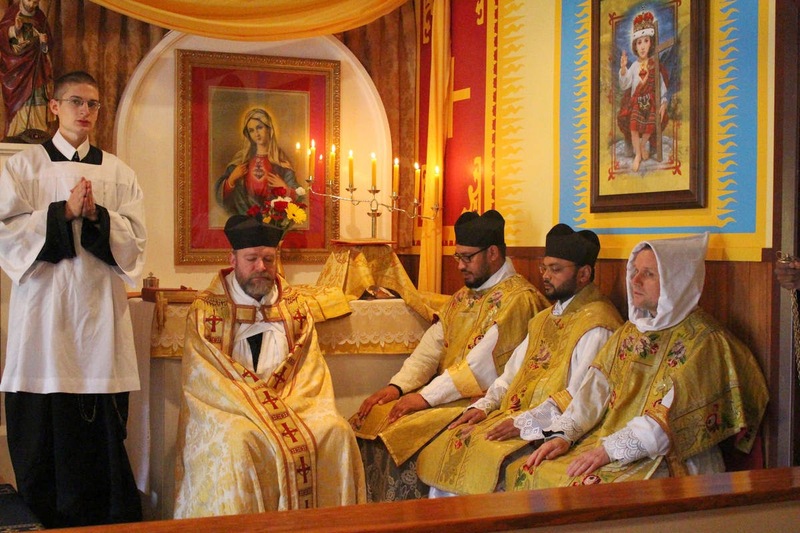 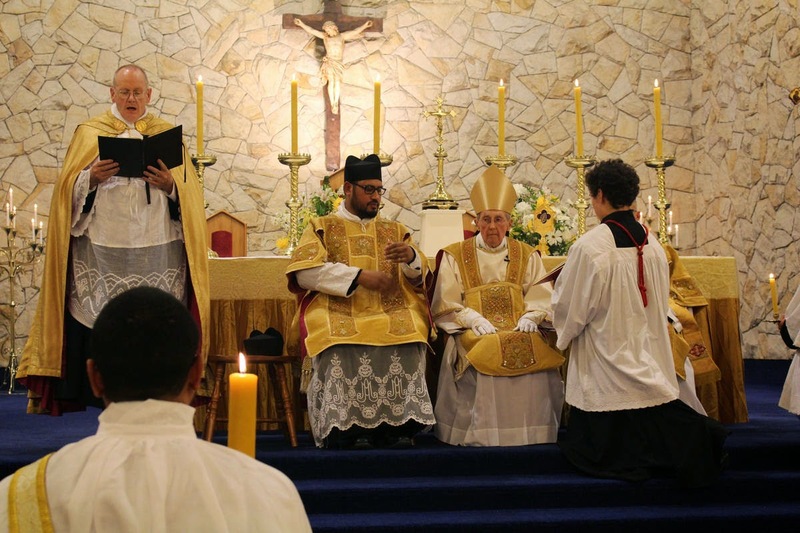 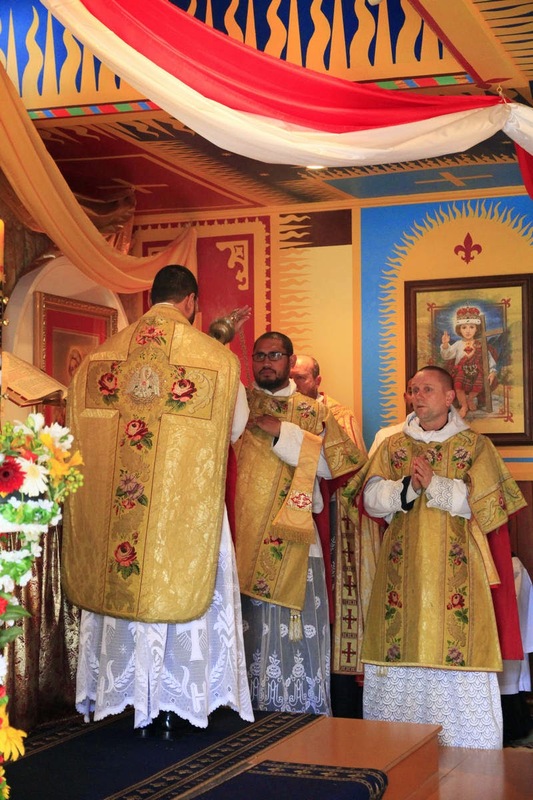 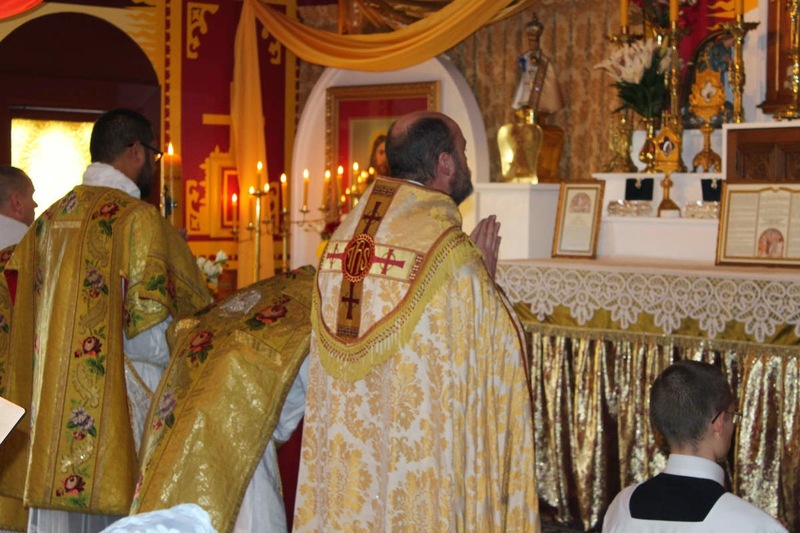 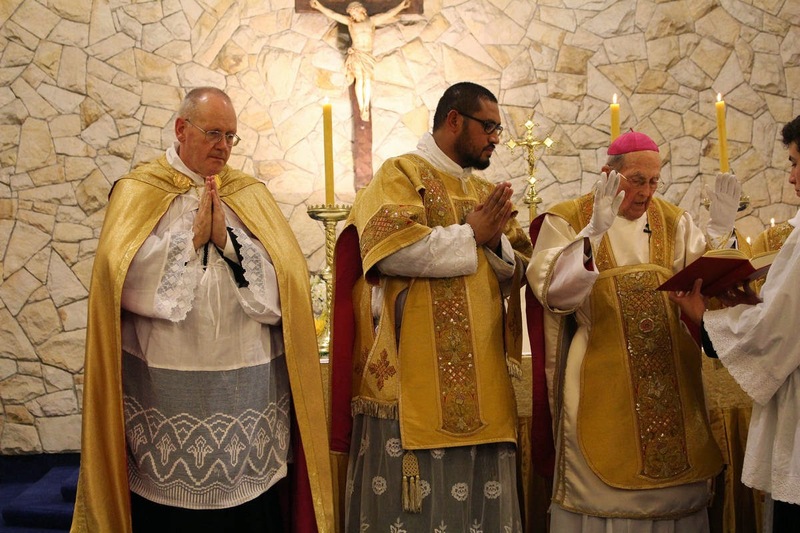 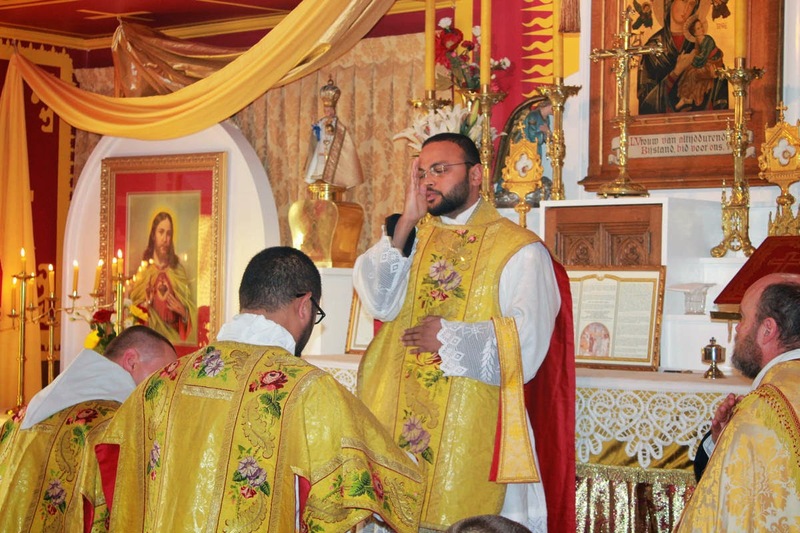 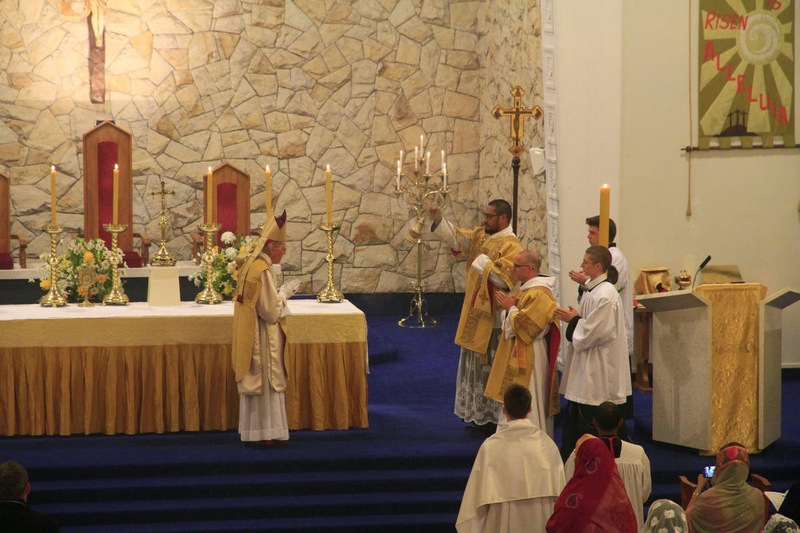 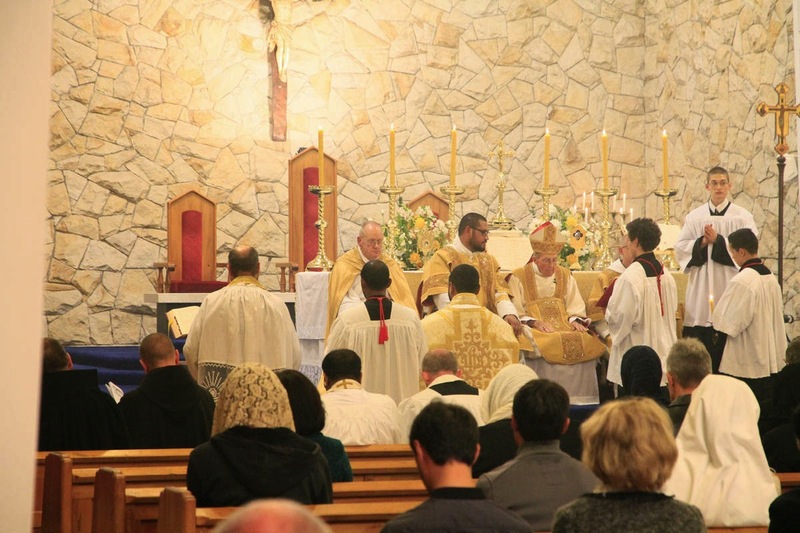 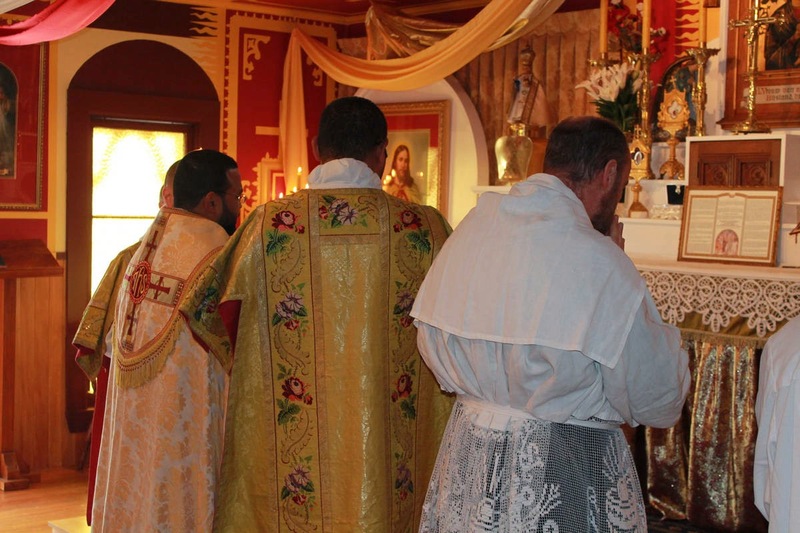 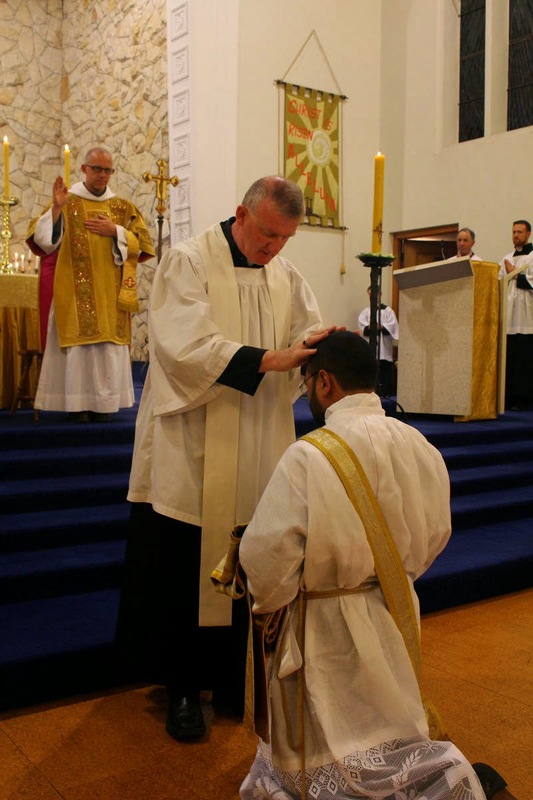 In the previous two posts you have seen photos from Fr Jean-Marie's Ordination and First Mass. 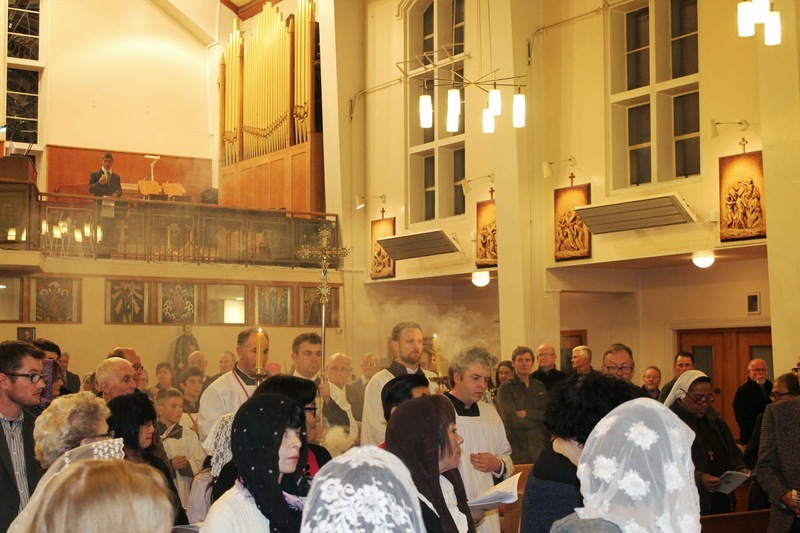 Some of the music has now been uploaded for your enjoyment. 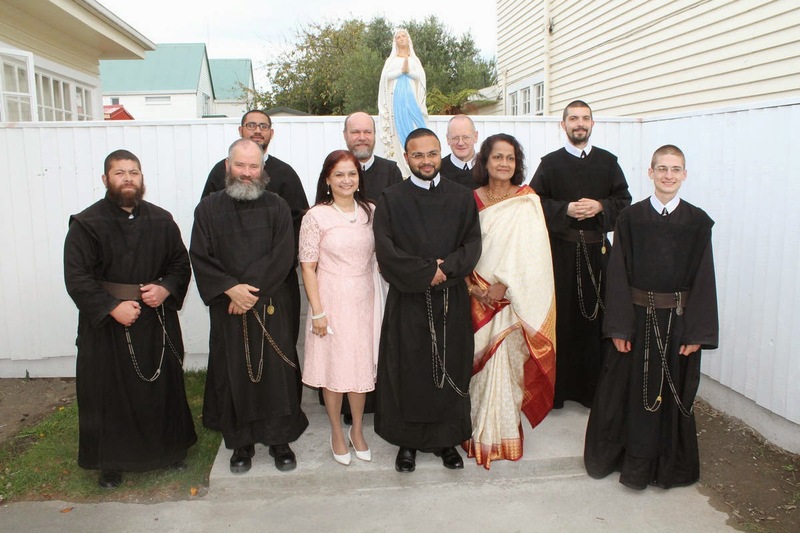 The choir of the Latin Mass Chaplaincy here in Christchurch sang Missa O Quam Gloriosum by Tomás Luis de Victoria, which was composed in 1572. 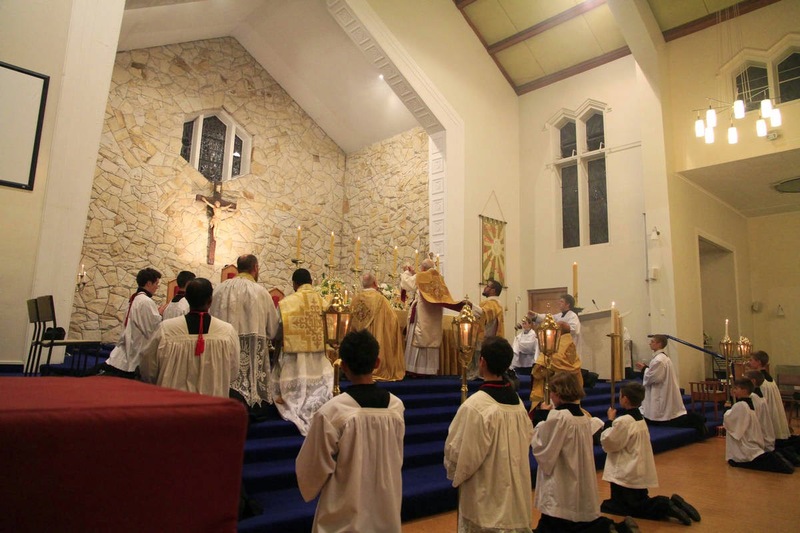 They also sung Palestrins's Sicut Cervus during Holy Communion. 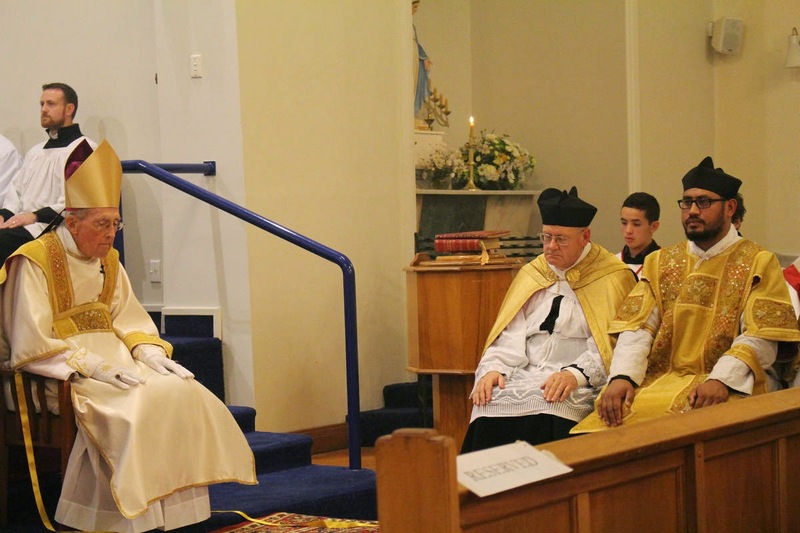 Fr Jean Marie, F.SS.R. 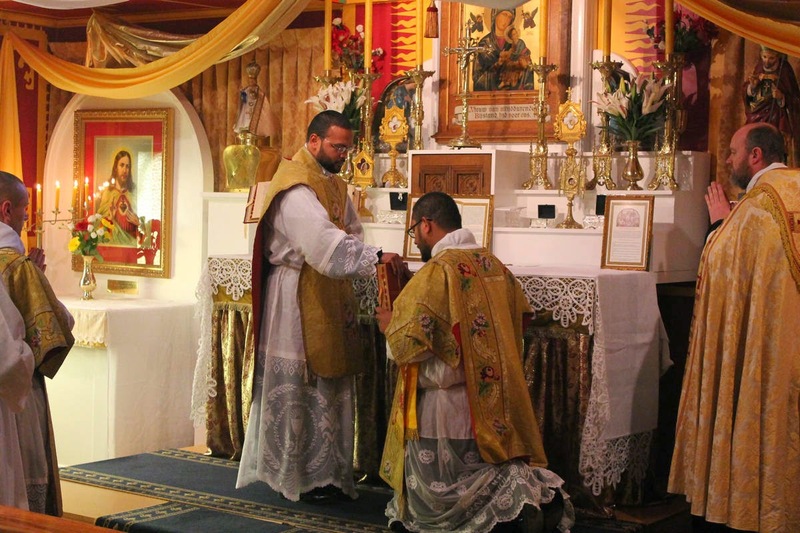 celebrated his Fist Solemn Mass on Quasimodo Sunday, also called Low Sunday and Divine Mercy Sunday. 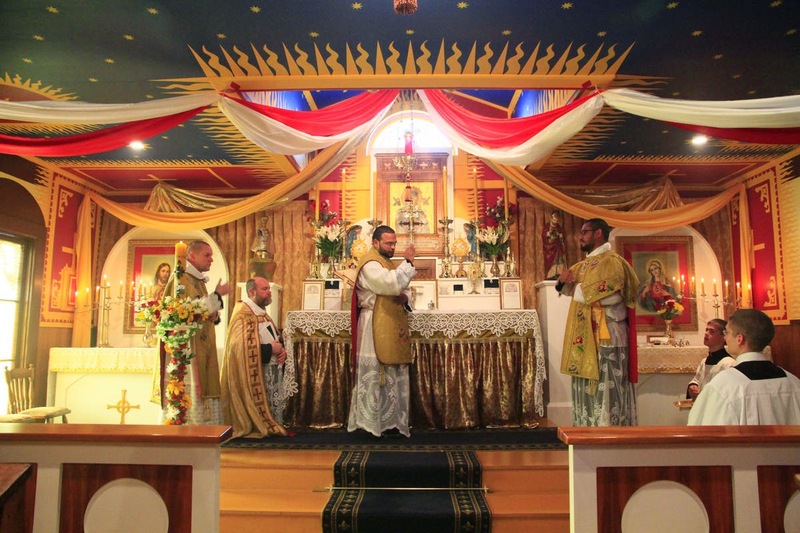 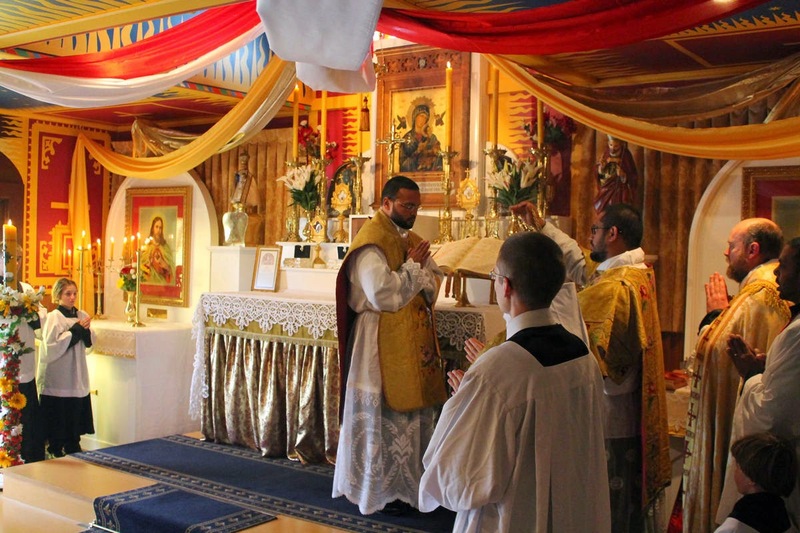 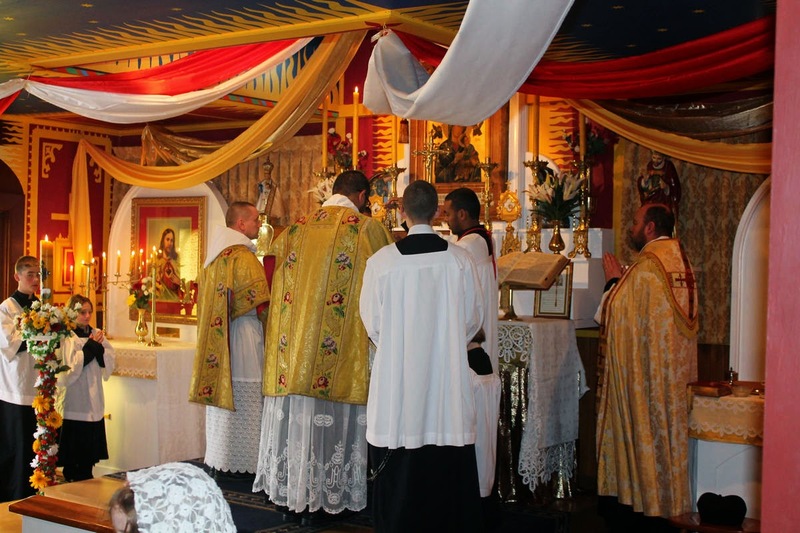 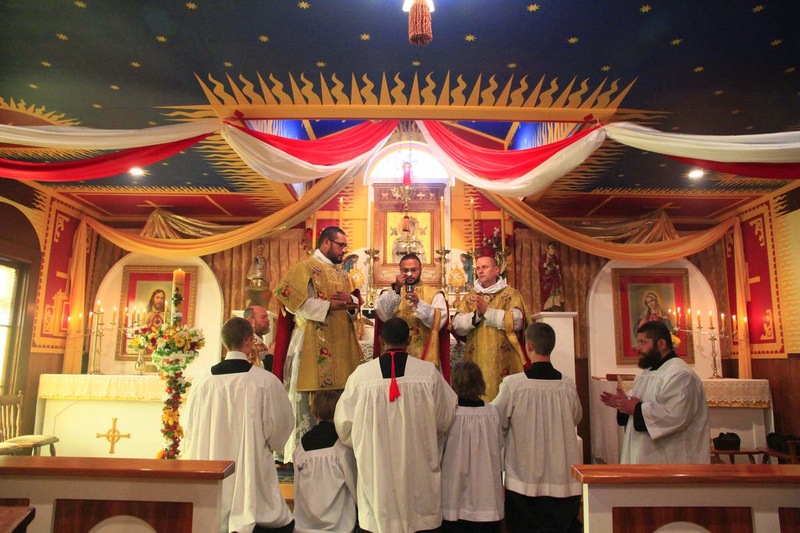 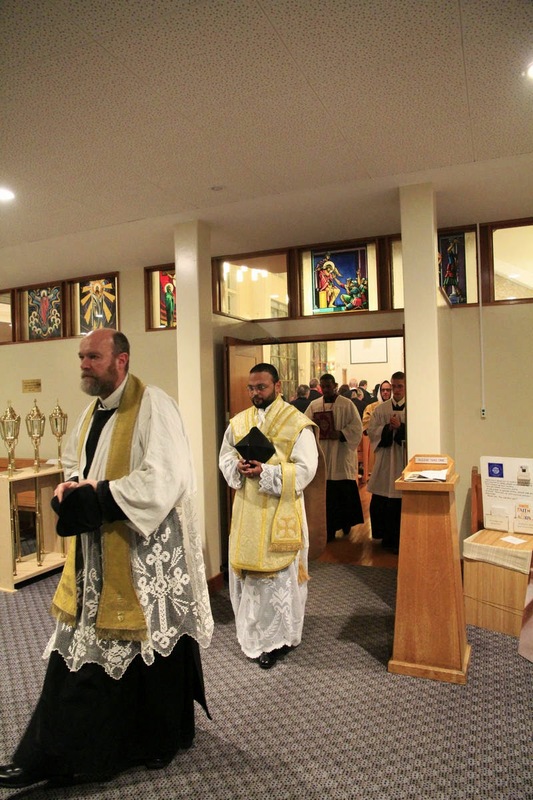 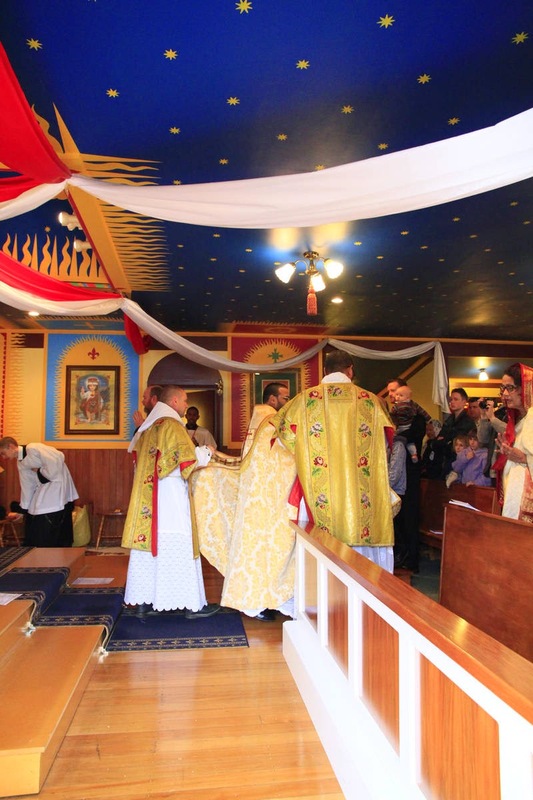 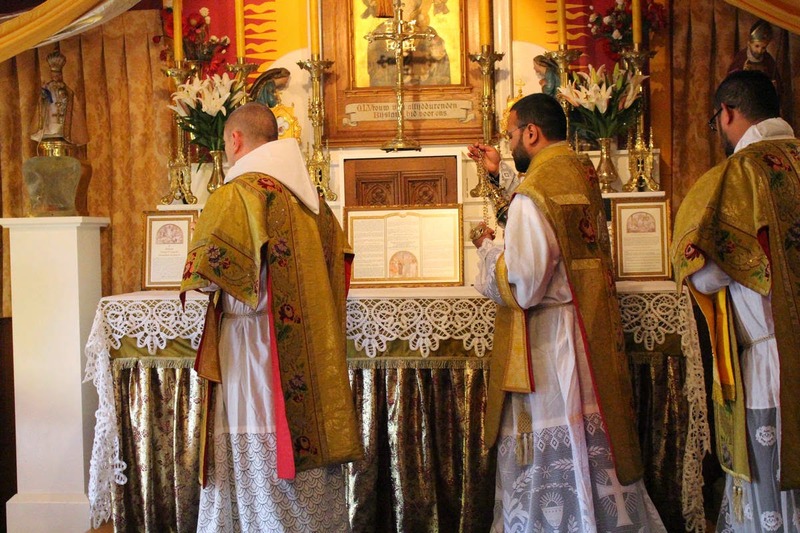 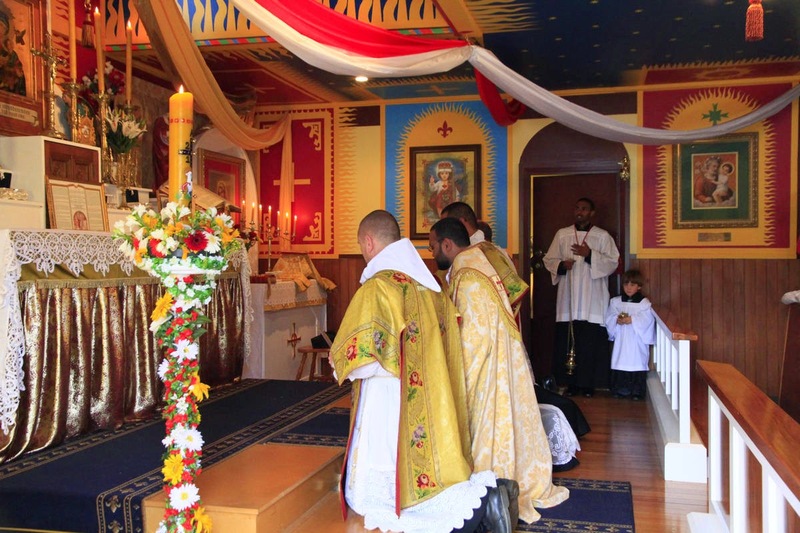 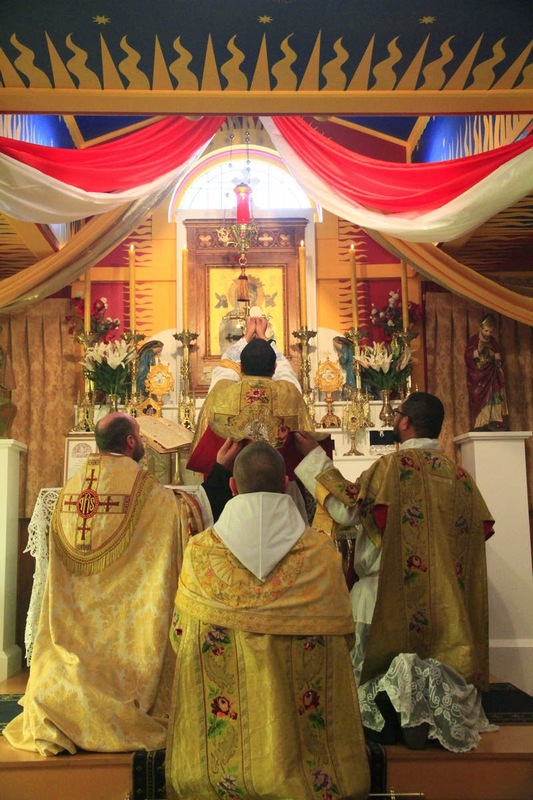 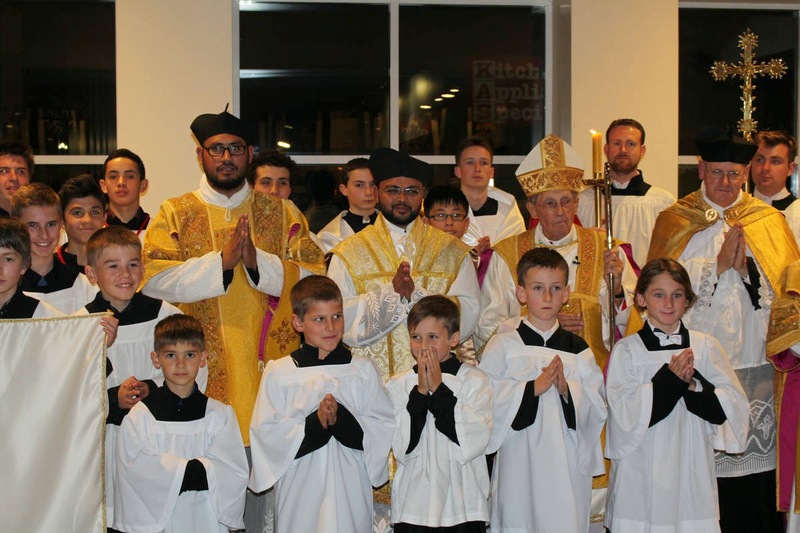 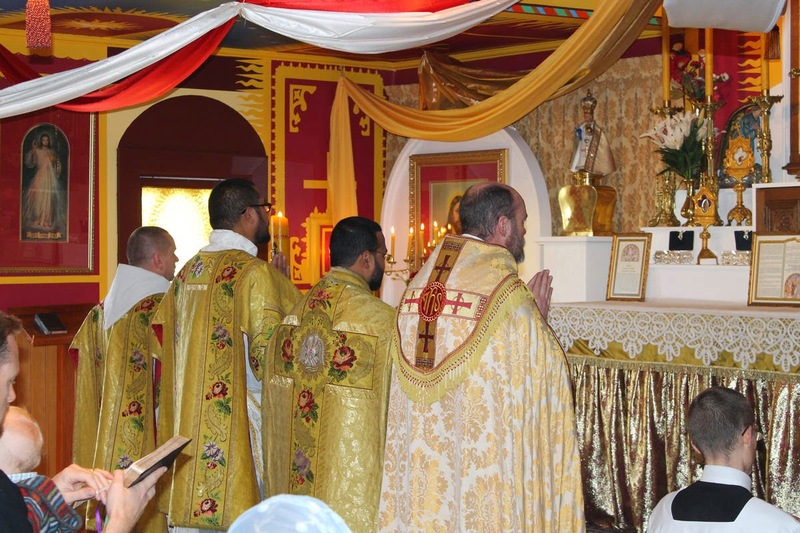 He celebrated Holy Mass at Our Mother of Perpetual Succour Oratory which is attached to our Monastery here in Christchurch, New Zealand, so it was the main Sunday Mass for the faithful of the Latin Mass chaplaincy here in Christchurch. 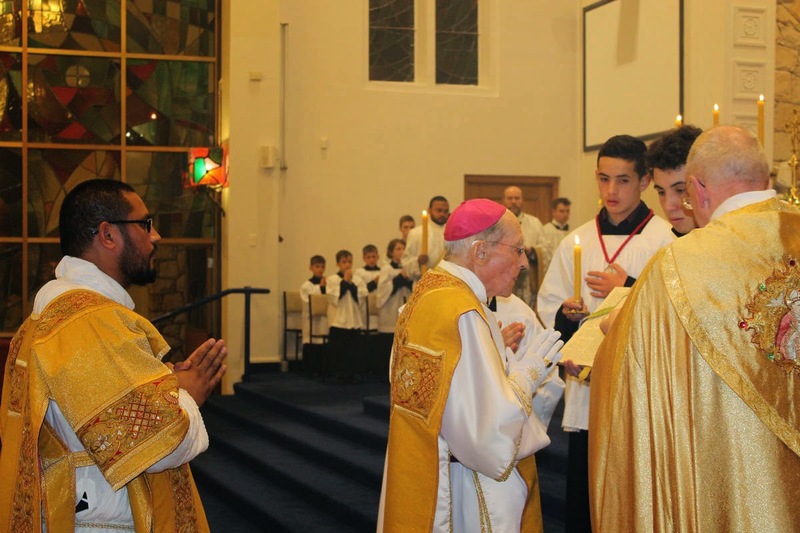 It was with great joy that we welcomed Dom Andrews, O.S.B. 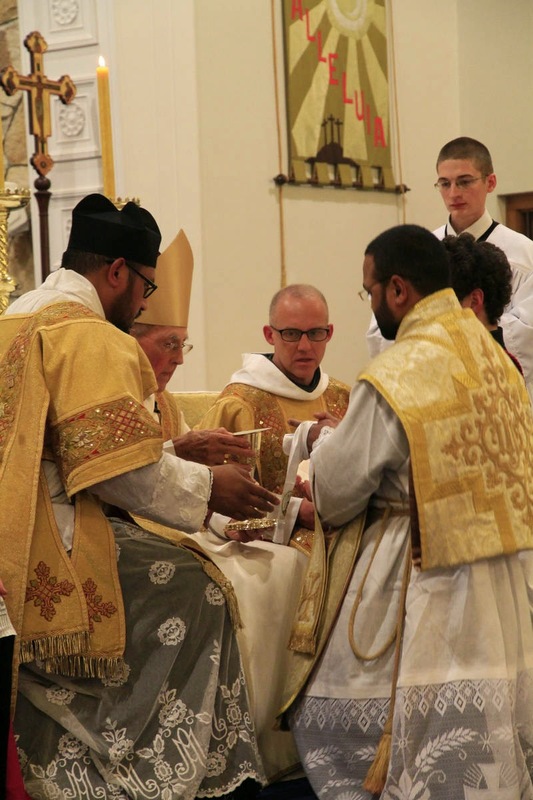 who came from Clear Creek Monastery in America to be with us for Fr Jean's ordination. 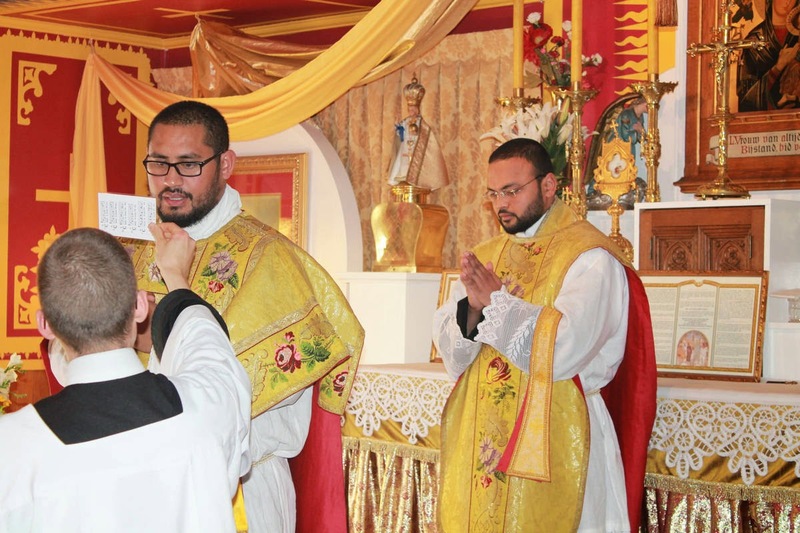 He was Subdeacon for Father's First Solemn Mass. 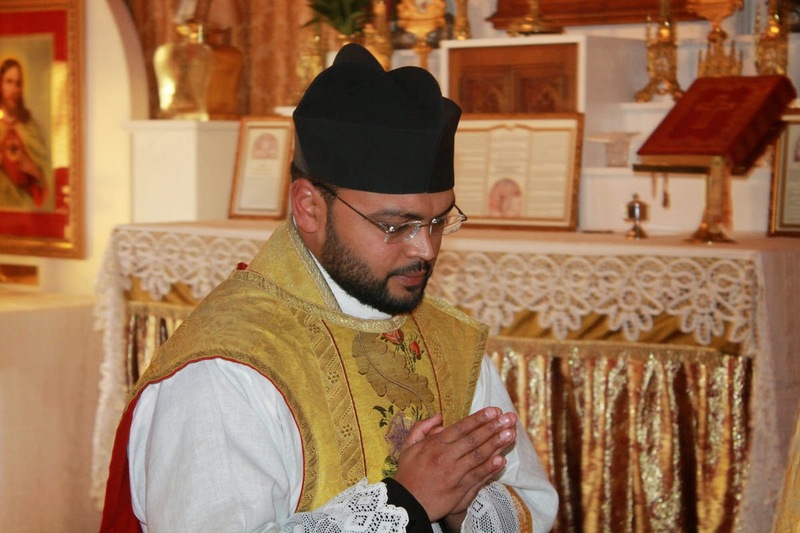 Very Rev Fr Anthony Mary, F.SS.R. 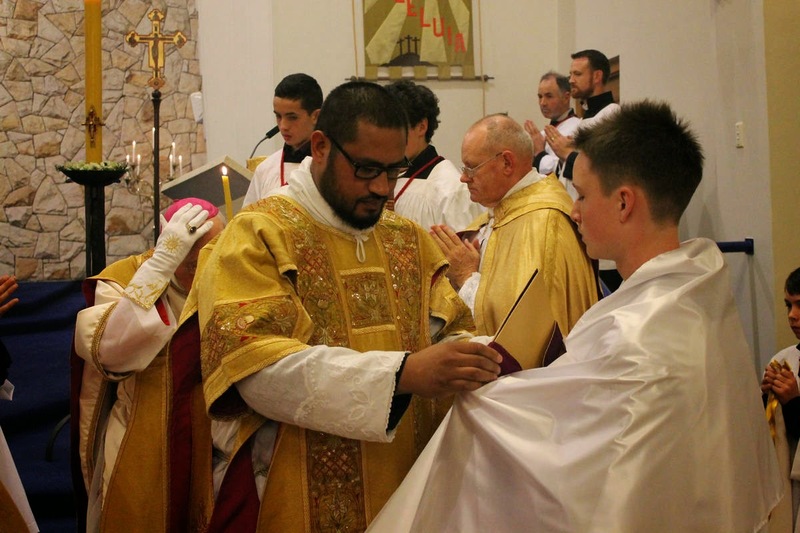 was Assistant Priest. 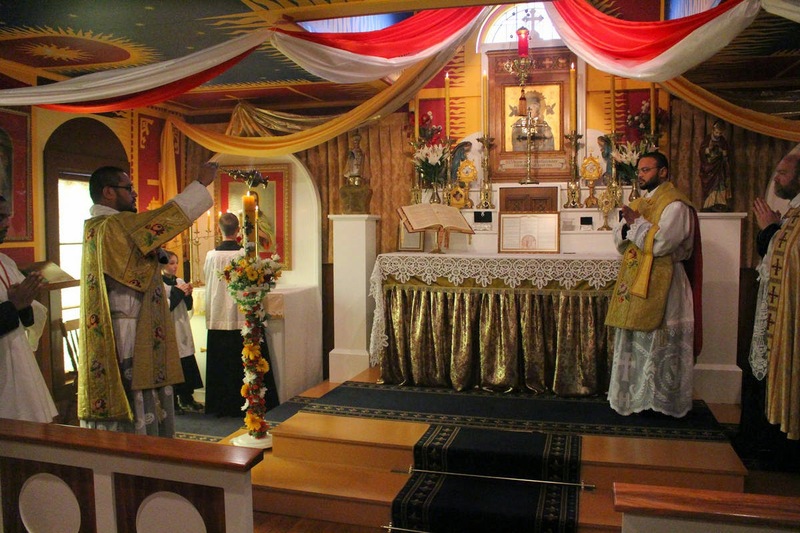 The Vidi Aquam, which replaces the Asperges during Paschal Time. 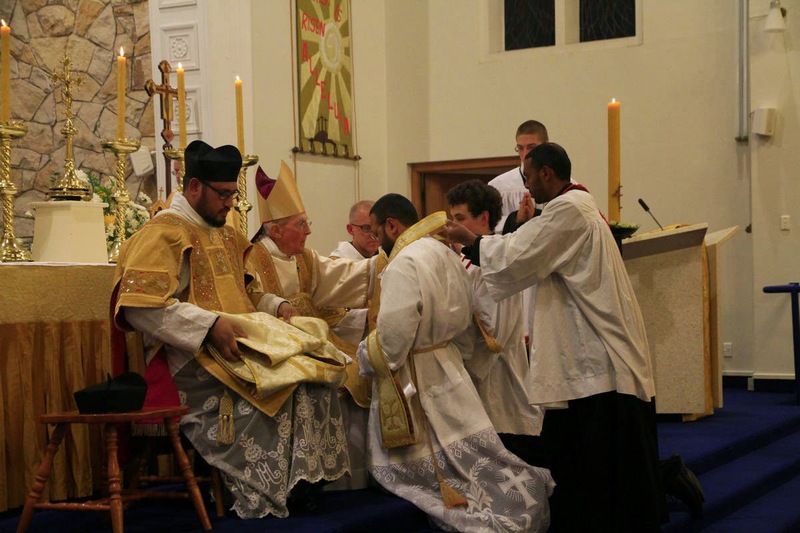 After the Vidi Aquam, the Deacon and Sub-deacon assist Fr Jean-Marie to put on the chasuble. 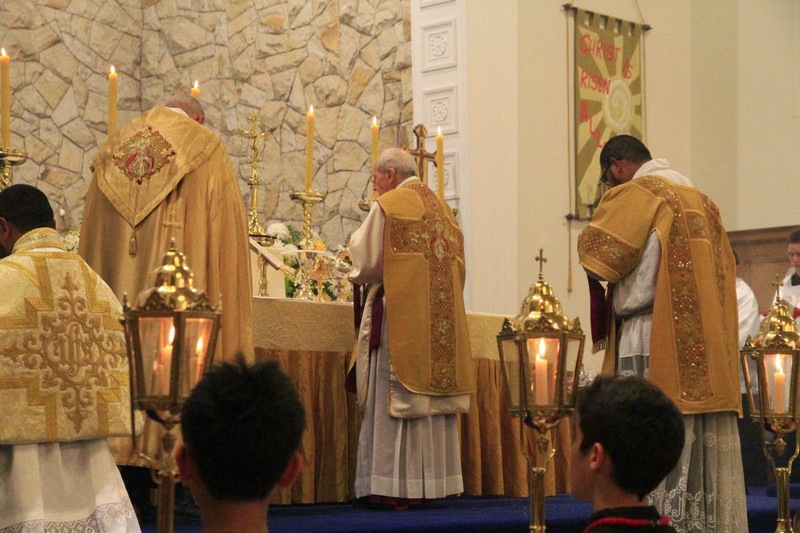 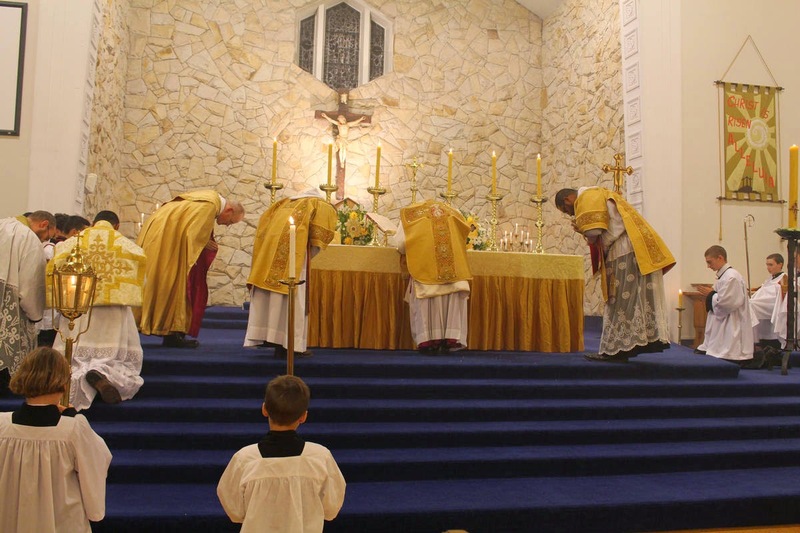 Holy Mass begins with the Prayers at the Foot of the Altar. 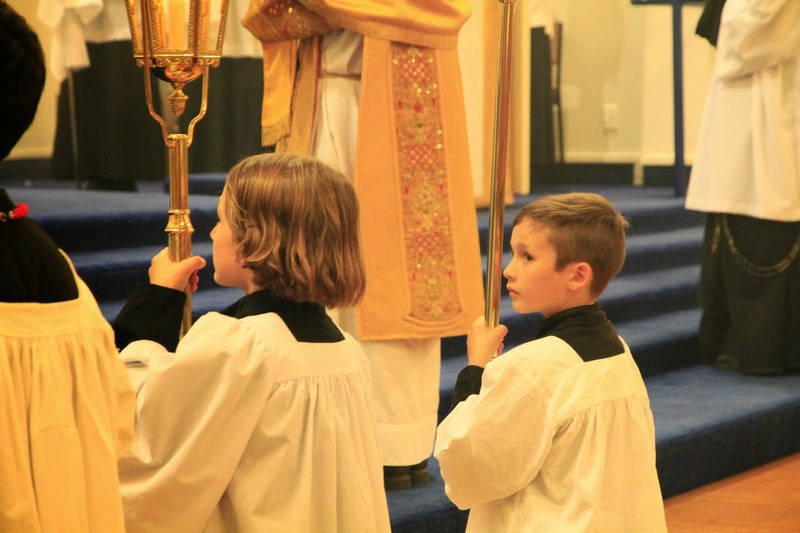 Father is incensed by the Deacon. 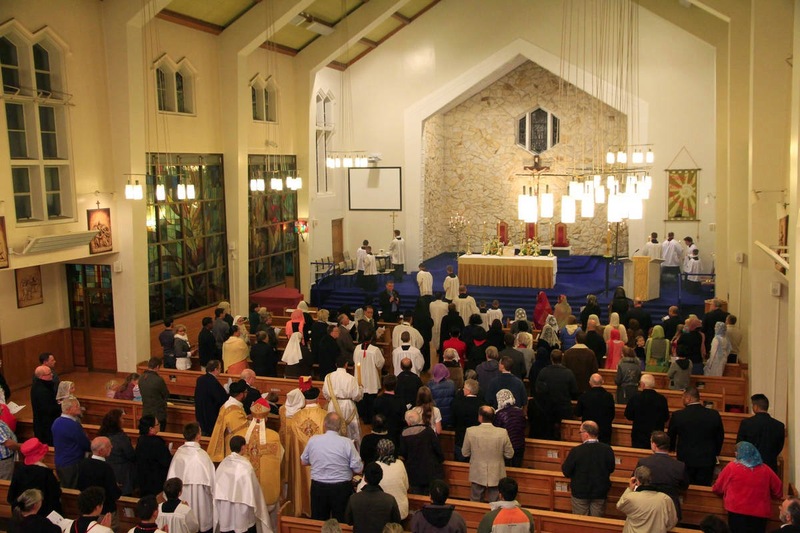 While the Gloria is chanted the ministers are seated. 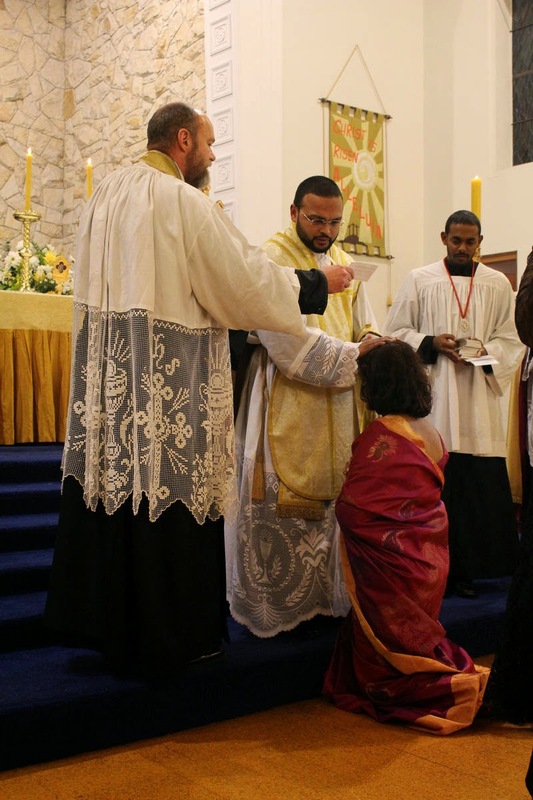 The Deacon receives the blessing to chant the Gospel. 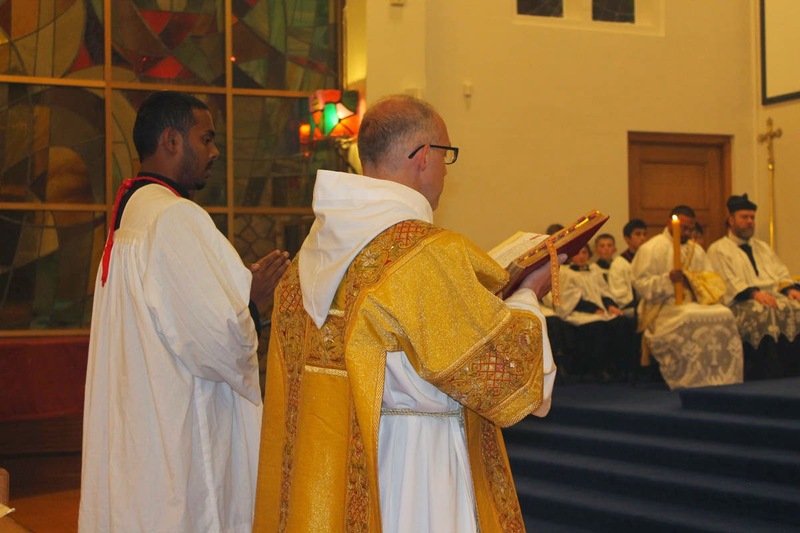 Father Jean Marie turns to face the Gospel whilst it is being chanted by the Deacon. 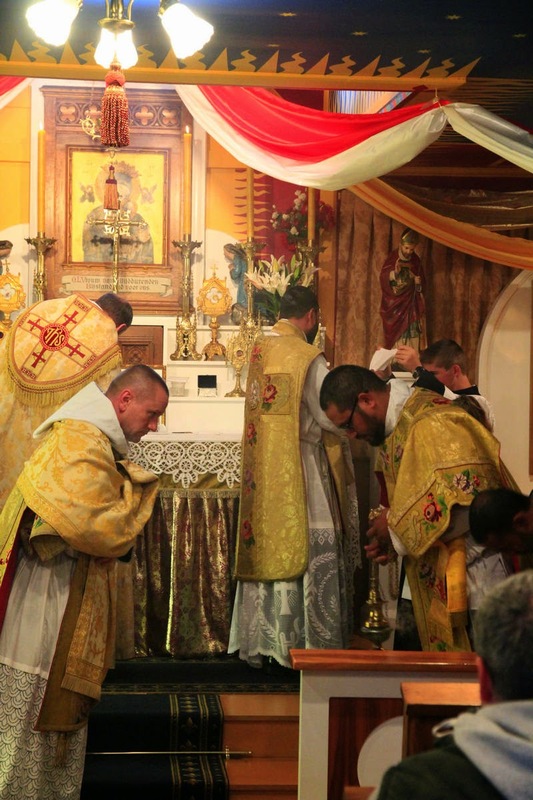 The Lavabo: Father washes his fingers in preparation for the consecration when he will hold God between them. 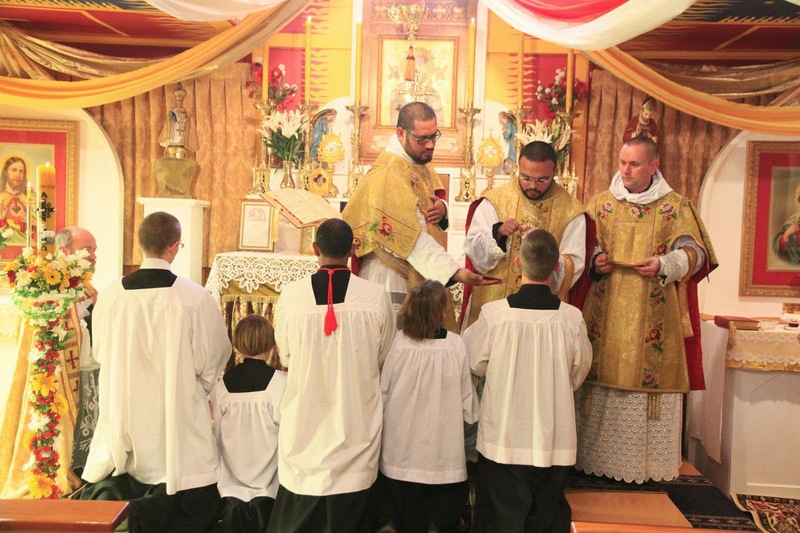 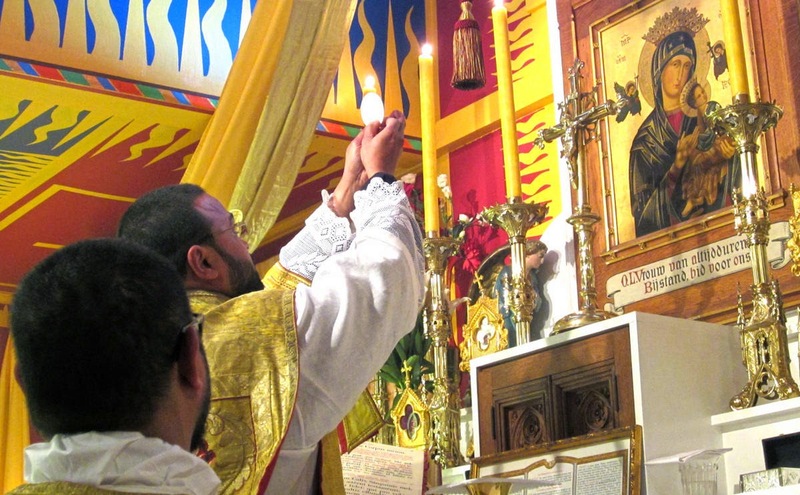 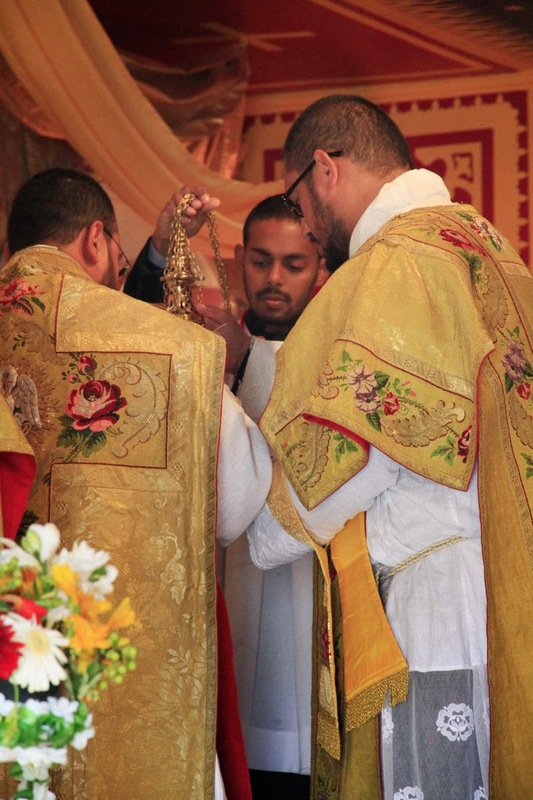 Father Jean-Marie consecrates the Sacred Host. 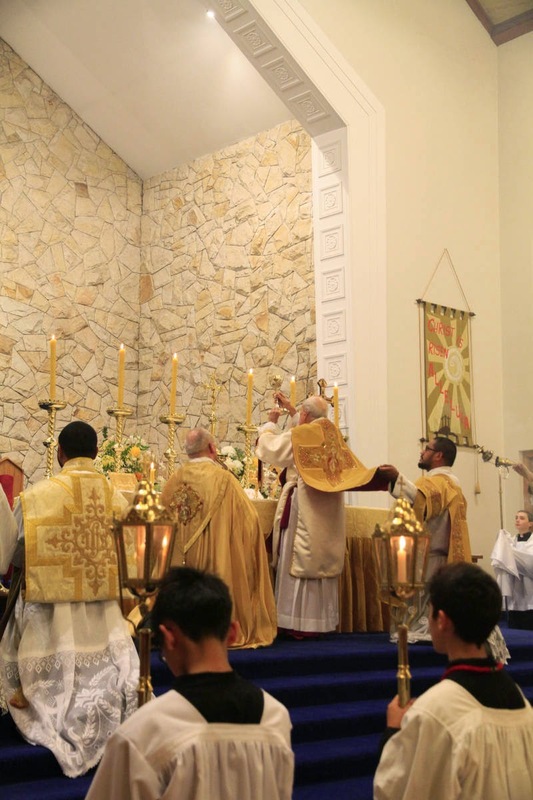 Elevating the Precious Blood of Our Lord Jesus Christ. 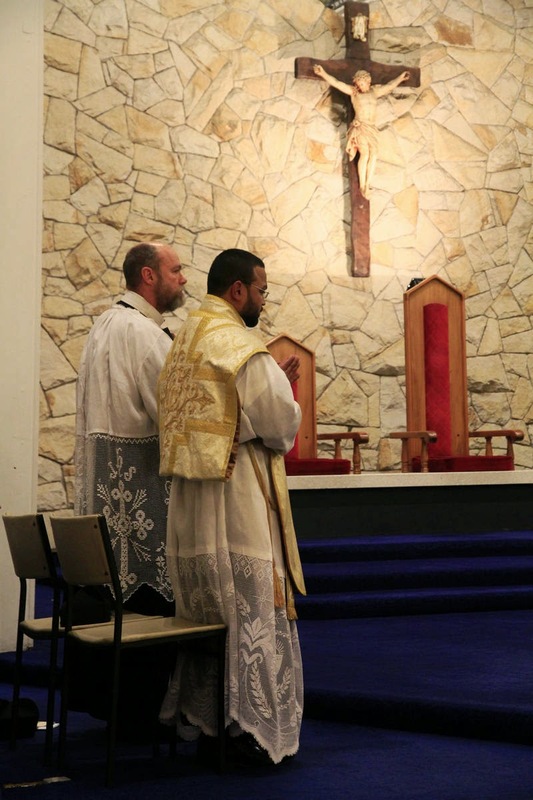 Father gives the absolution after the Confiteor. 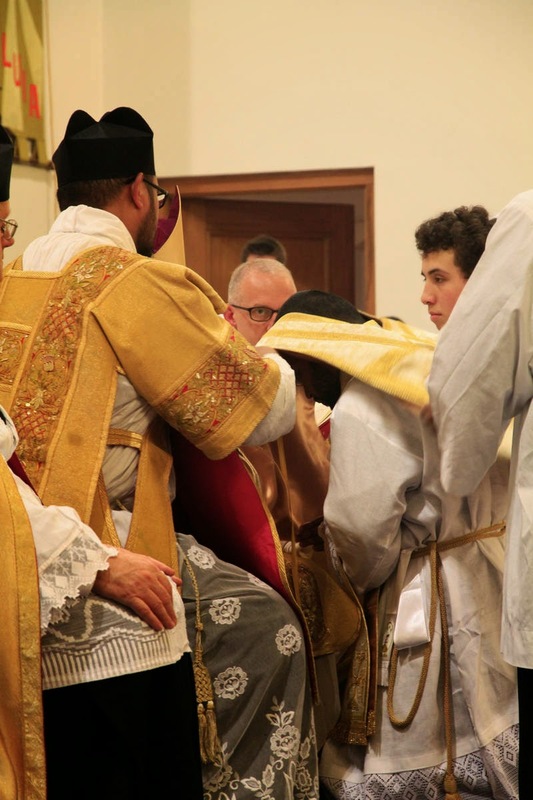 Ecce qui tollit peccata mundi! 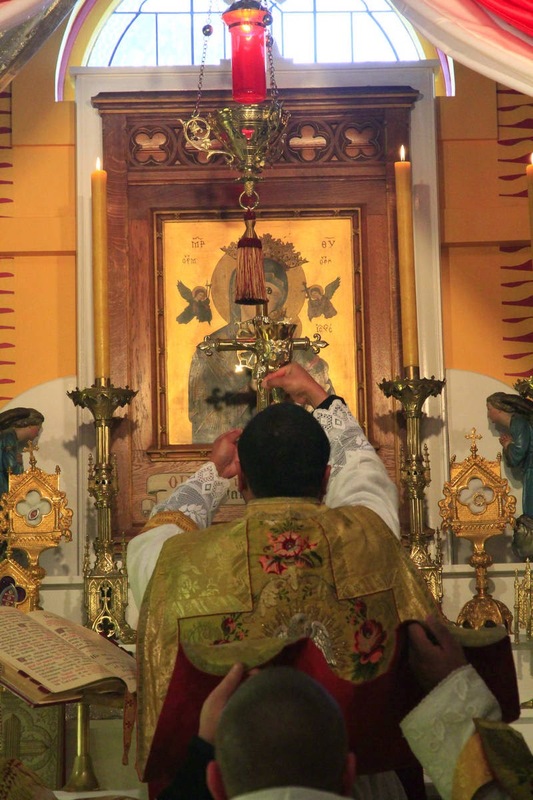 Behold HimWho taketh away the sins of the world! 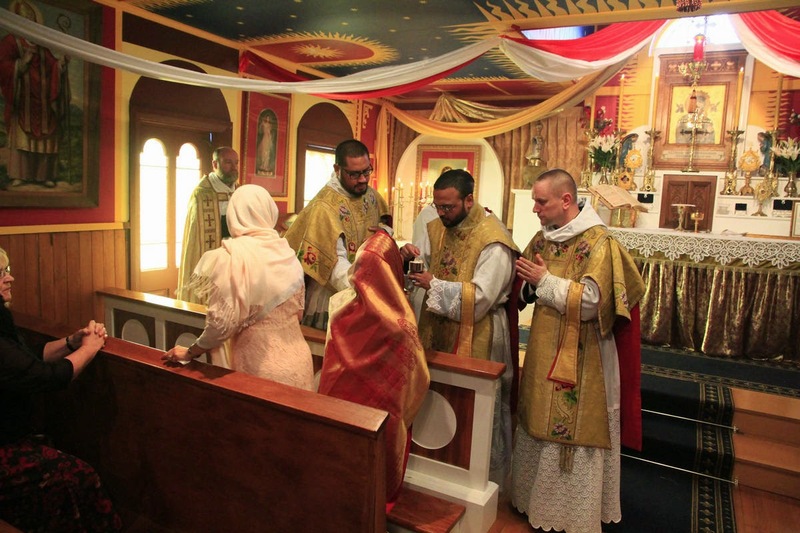 Father gives Holy Communion to his Mother. 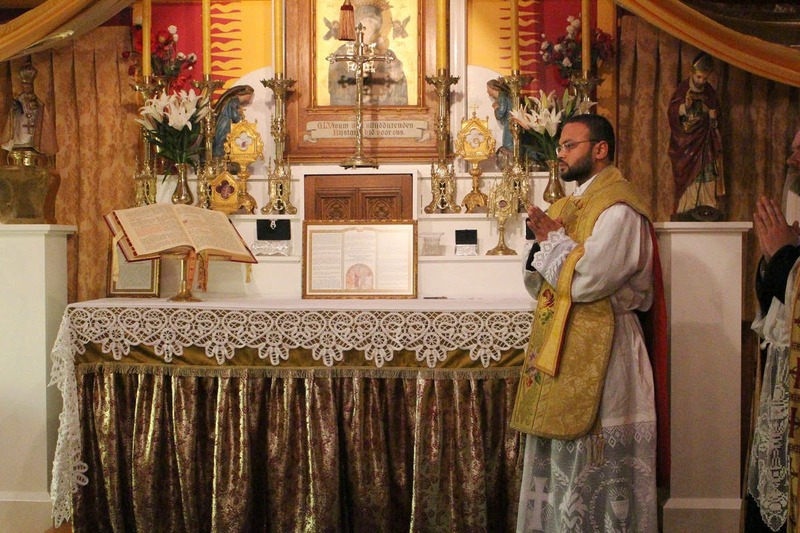 The Deacon chants the Ite Missa Est. 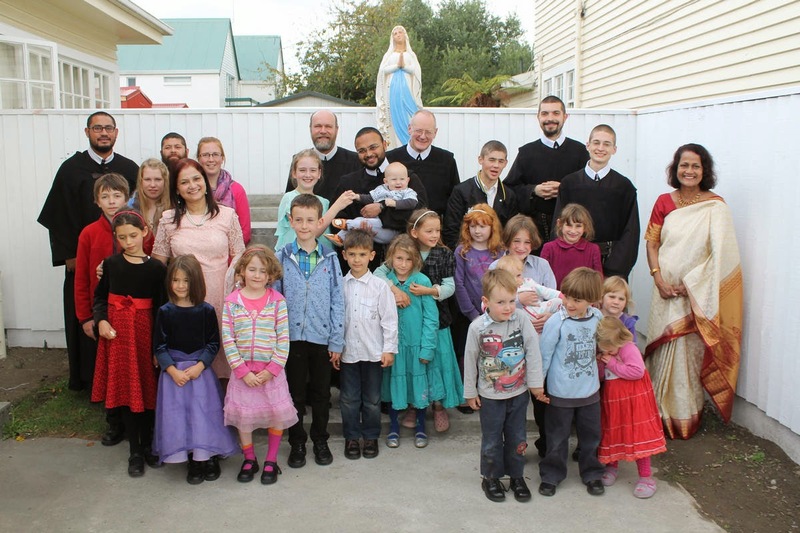 Father with his confreres and family. 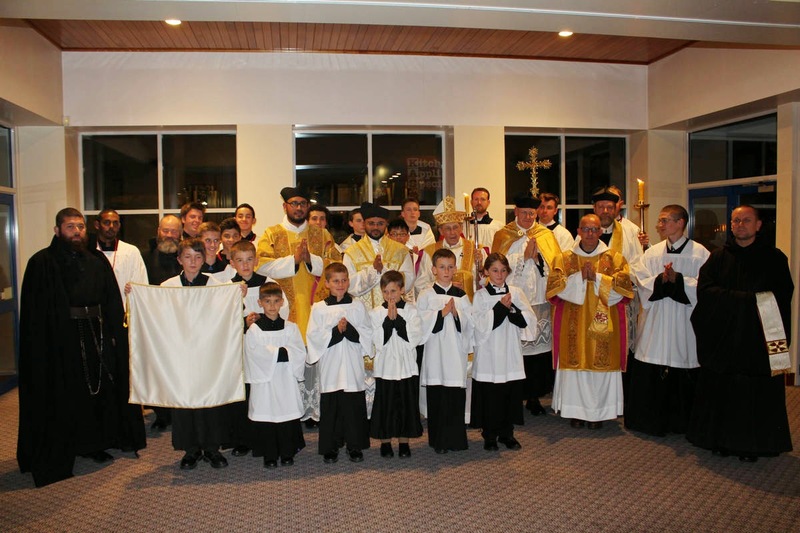 With some of the young people who make up the Latin Mass chaplaincy. 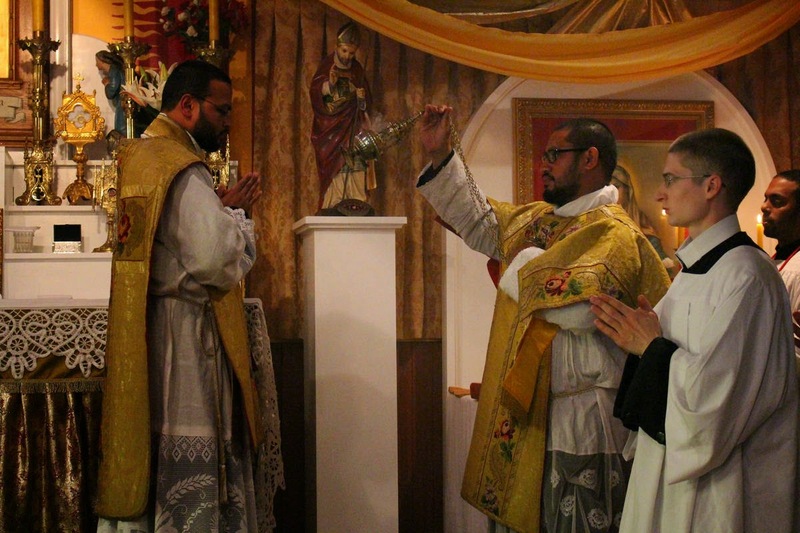 This Saturday past, we were overjoyed to witness our Br Jean-Marie, F.SS.R. 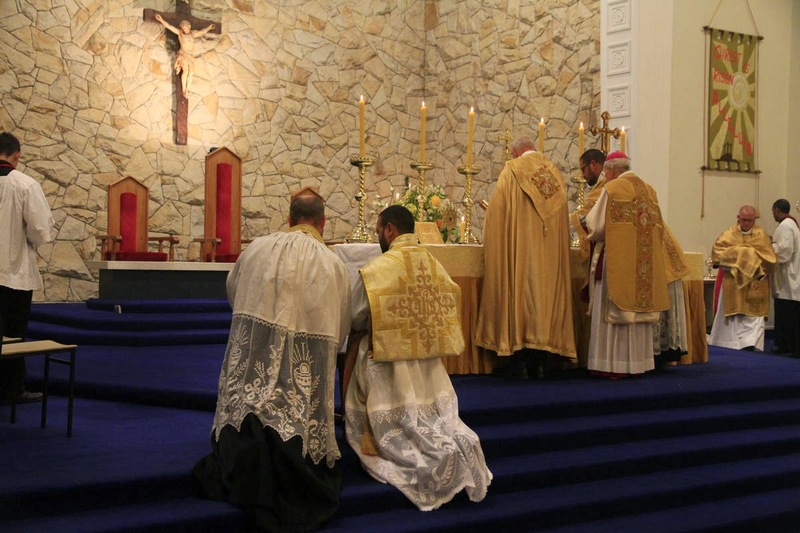 raised to the dignity of the Sacred Priesthood! 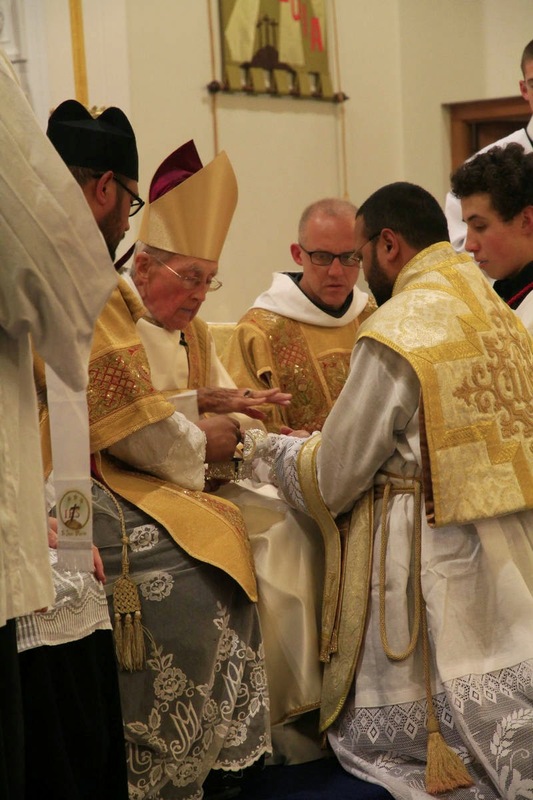 His Lordship bishop Basil Meeking, D.D. 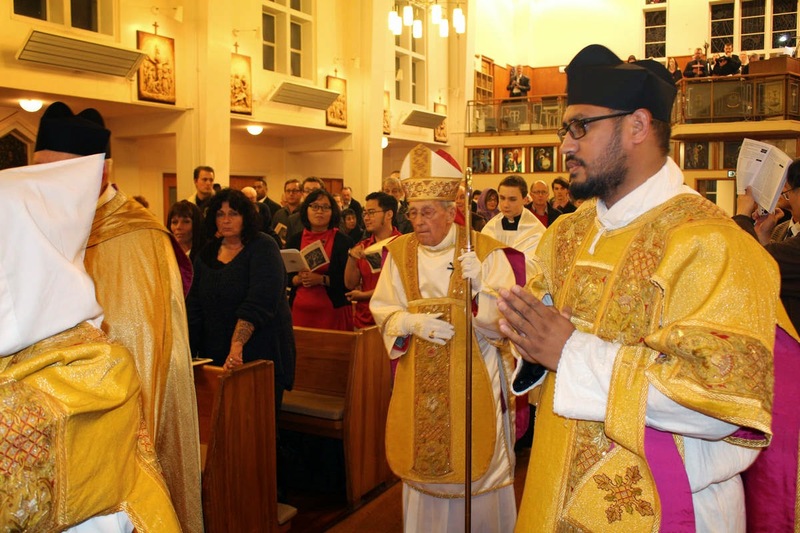 conferred the sacrament of Holy Orders in St Mary's Pro-Cathedral, Christchurch New Zealand. 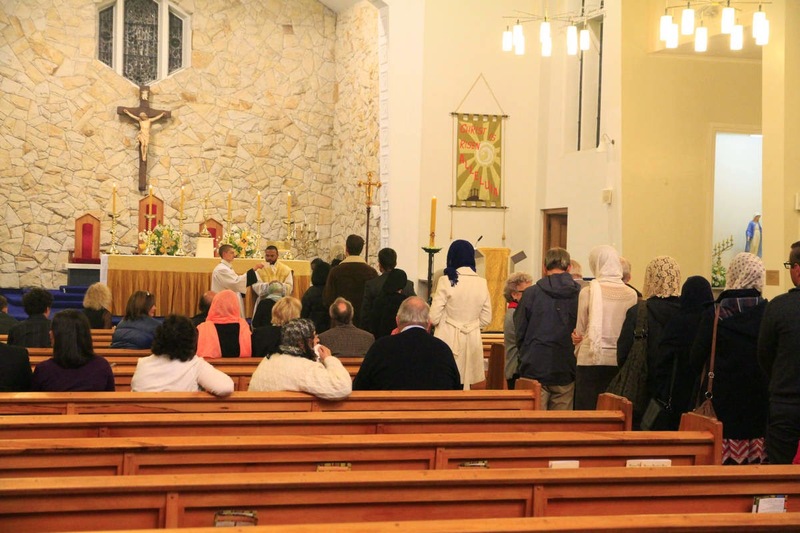 The ceremony and preparation involved the invaluable help of so many people and we would like to thank each one of them for all their efforts to make it a success. 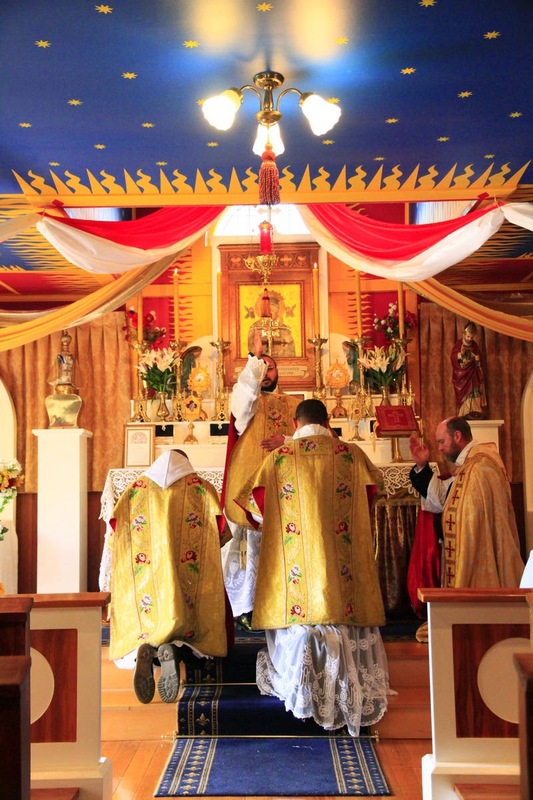 The first Extraordinary Form priestly ordination in the South Island of New Zealand for decades begins. 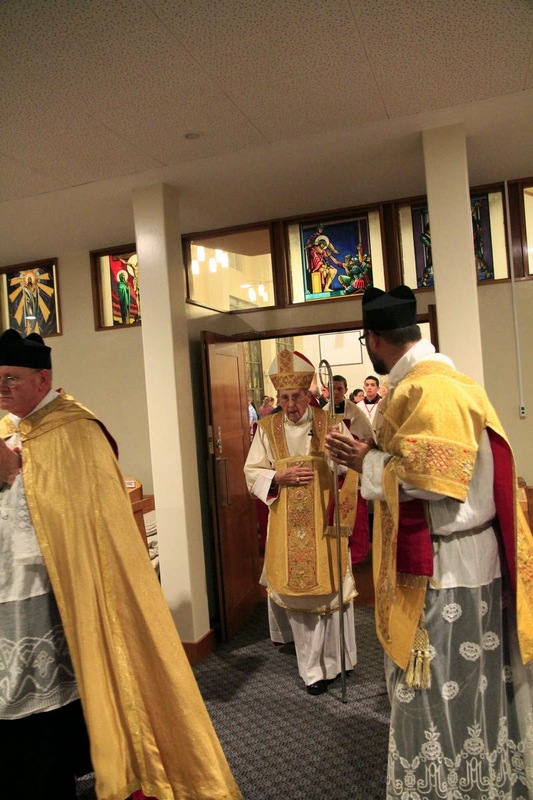 His Lordship bishop Basil Meeking processing to the Altar to commence the Mass of Ordination. 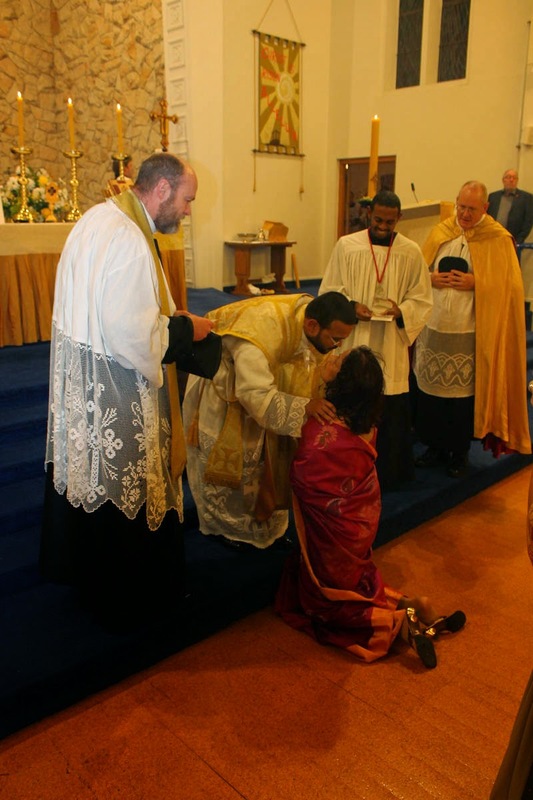 Very Rev Fr Michael Mary, F.SS.R. 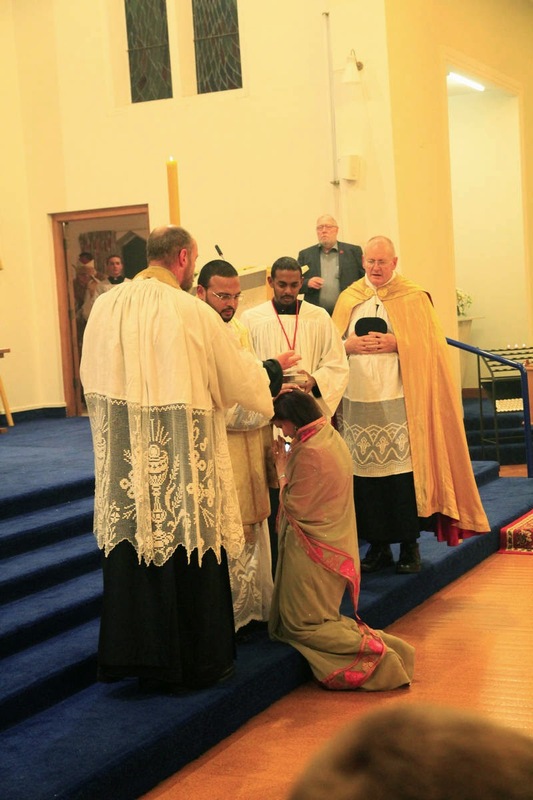 was priest-assistant and Fr Magdala Maria, F.SS.R. 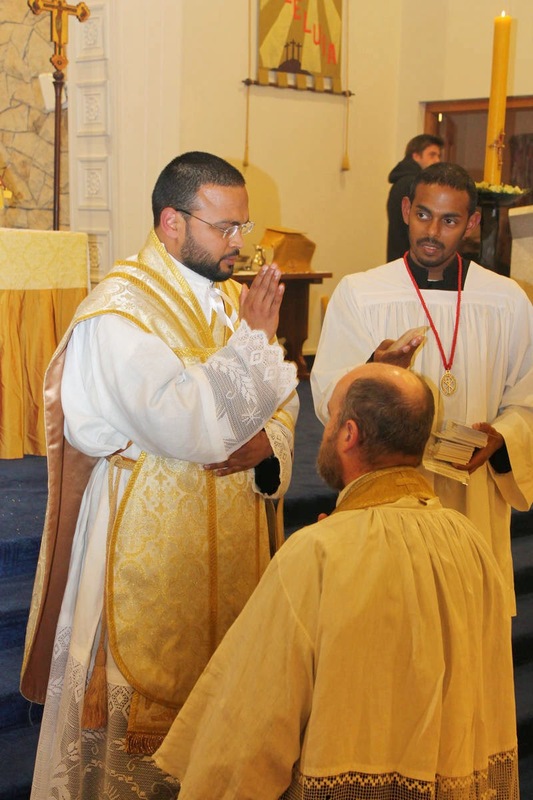 was Deacon. 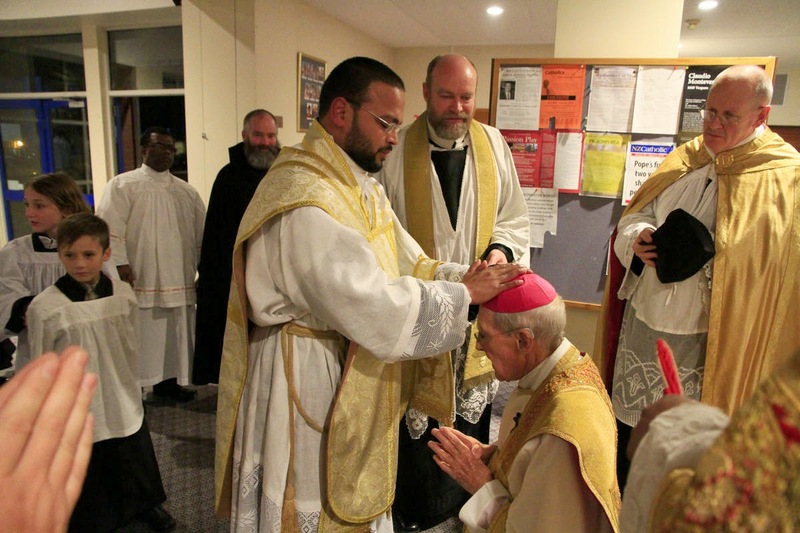 After the Deacon removes the bishop's mitre, he passes it to the Mitre-Bearer. 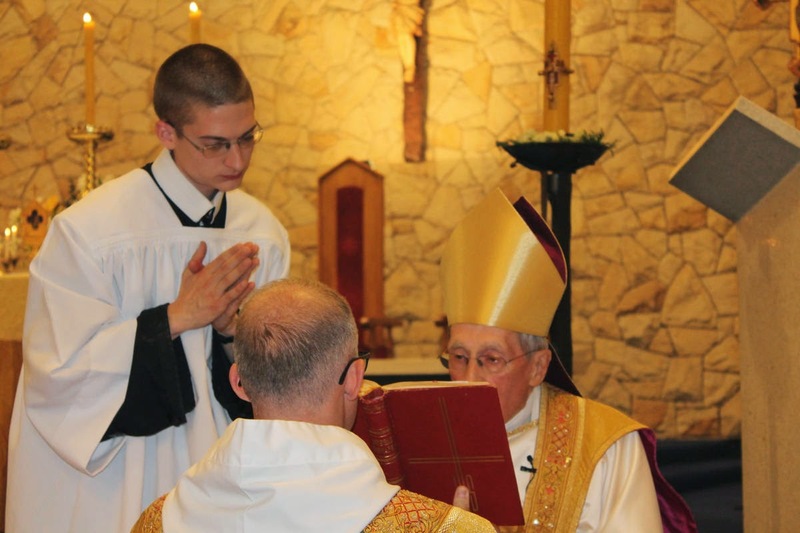 Fr Clément, C.S.J. 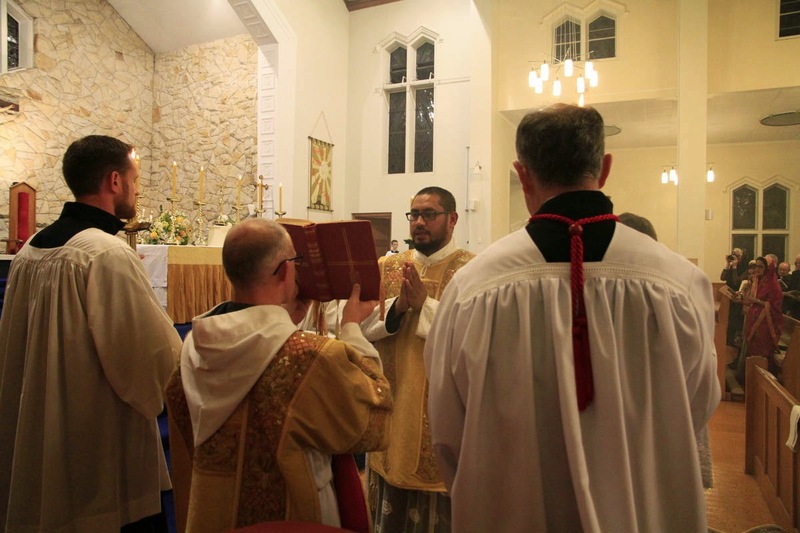 was Sub-deacon and here is chanting the Epistle. 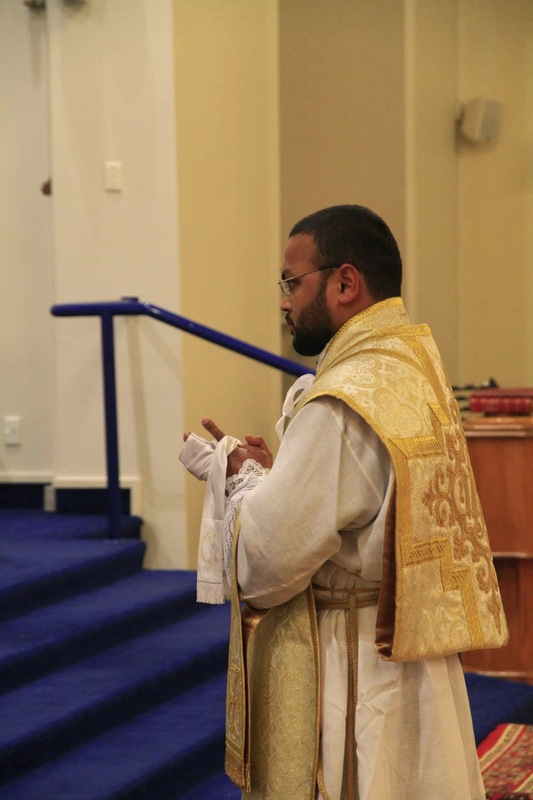 Very Rev Fr Michael Mary, F.SS.R. 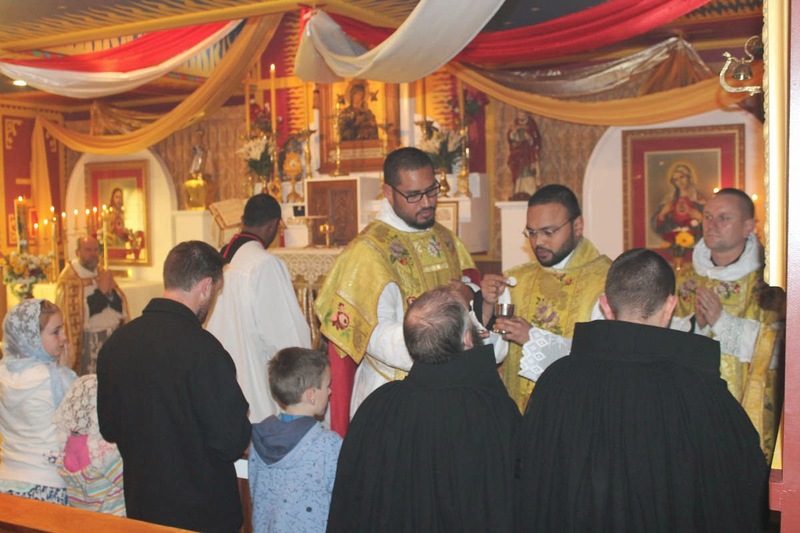 calls Br Jean-Marie, F.SS.R. 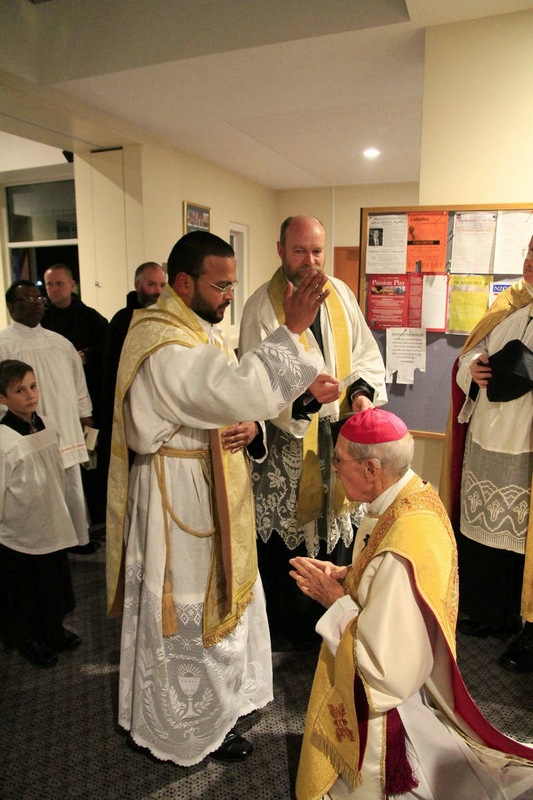 to present himself before the bishop. 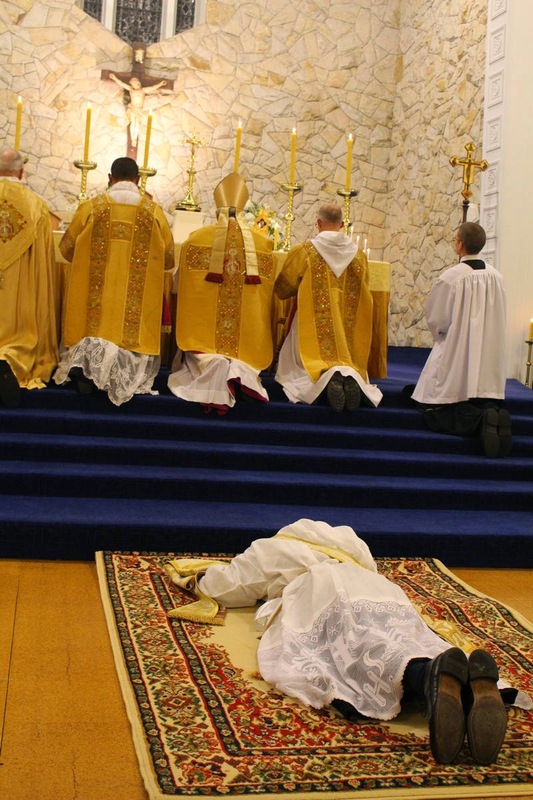 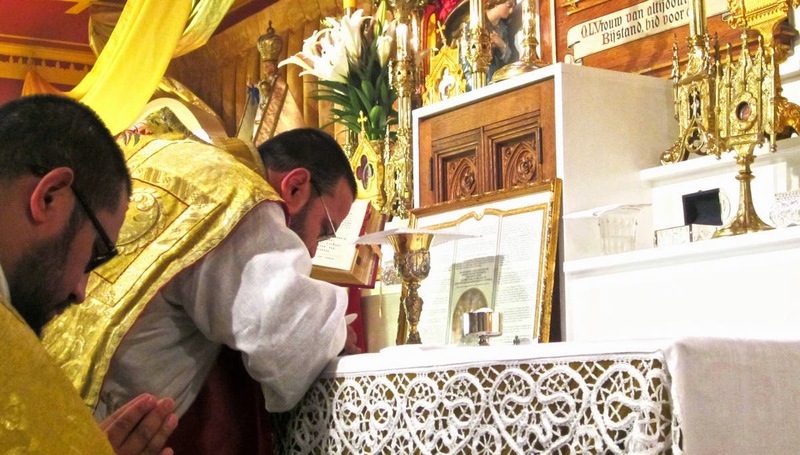 Brother prostrates himself before the altar while the Litany of the Saints is chanted. 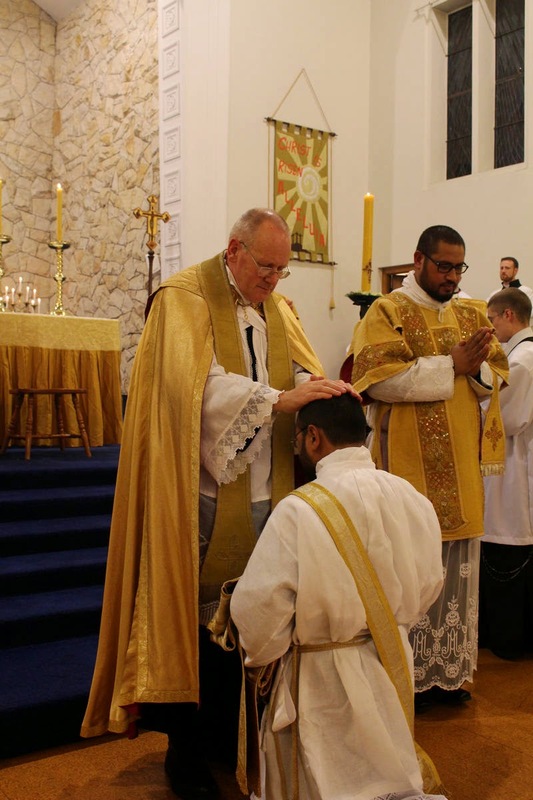 The Matter of the Sacrament of Holy Orders: The ordaining bishop lays his hands upon the head of the candidate for ordination. 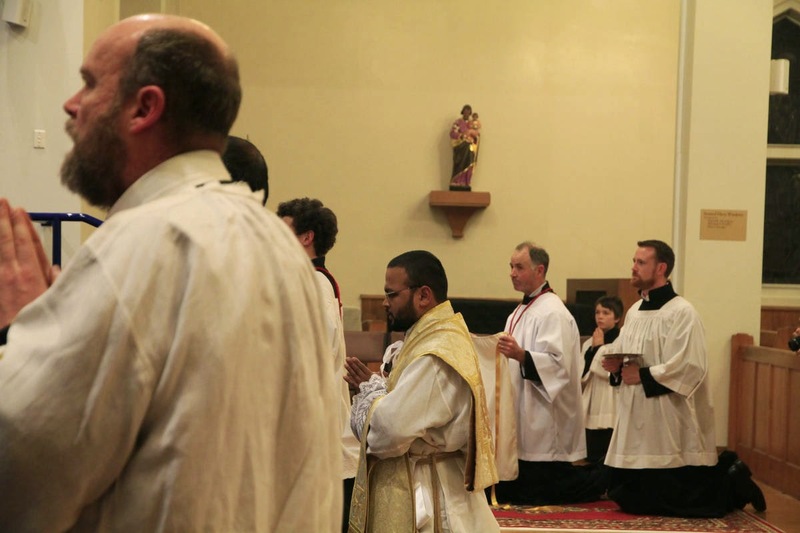 All the other priests present at the ordination are then invited to lay hands also. 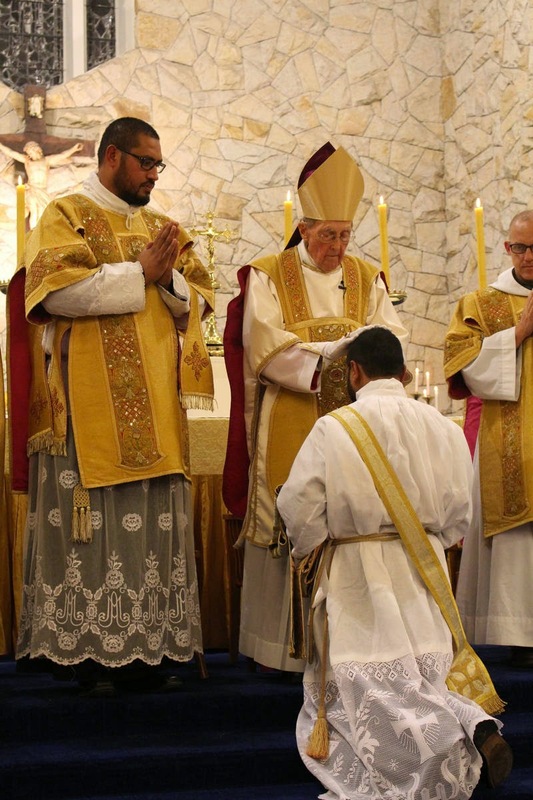 Extending his hands over Br Jean-Marie, the bishop pronounces the words which constitute the Form of the Sacrament, thus conferring the Priesthood upon FR JEAN-MARIE, F.SS.R. 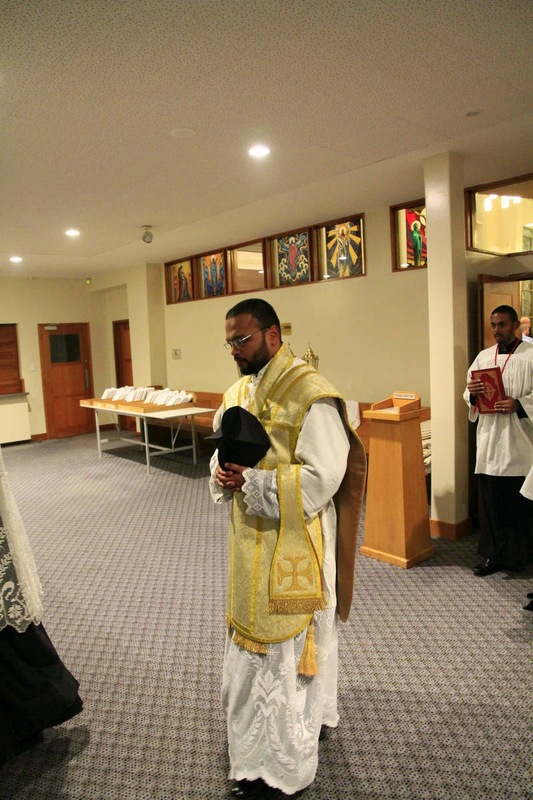 The stole is changed from the position across the shoulder (denoting a deacon) to around the neck (denoting a priest). 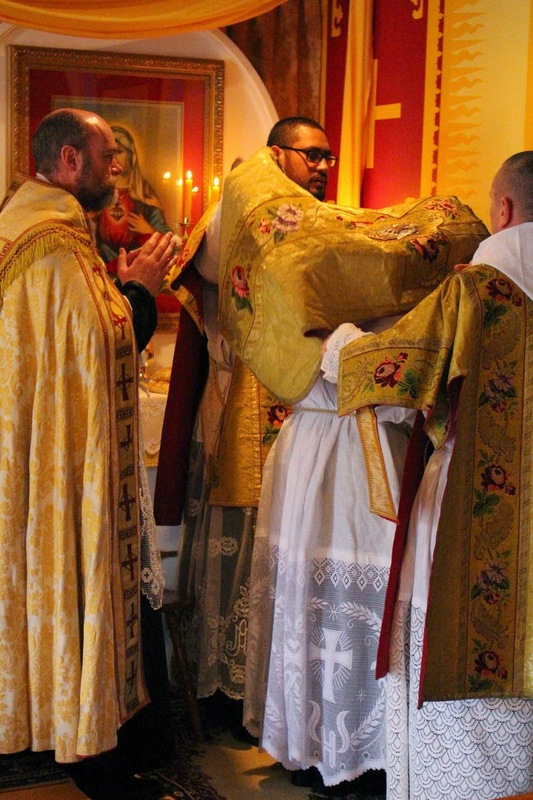 The priestly chasuble is placed over his head. 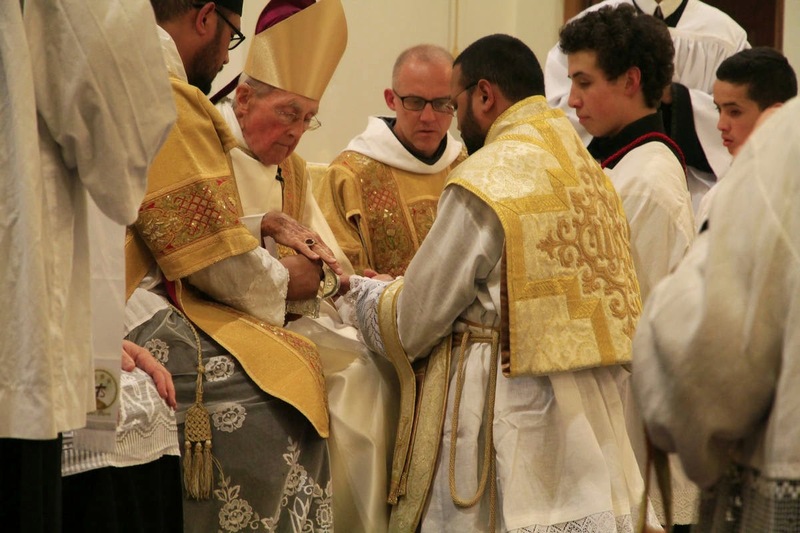 Bishop Meeking anoints the hands which will now grasp the Lord of Heaven and Earth in the Holy Sacrifice of the Mass. 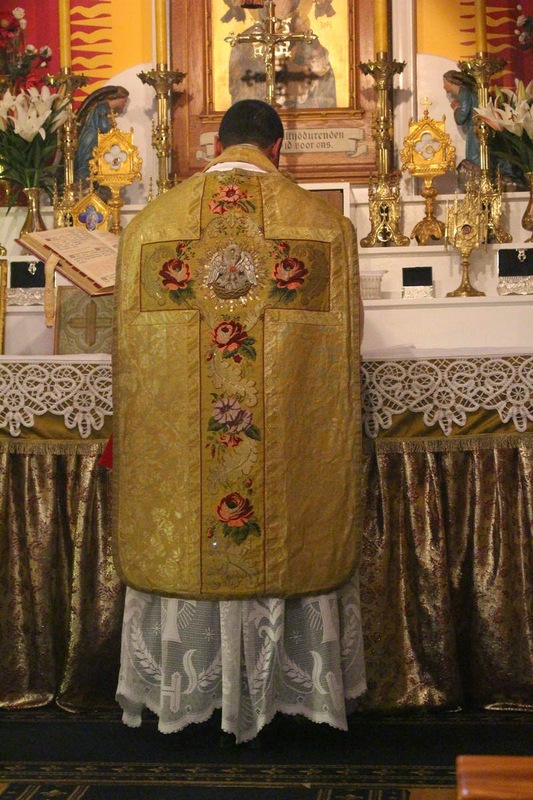 Father's annointed hands are bound together with linen. 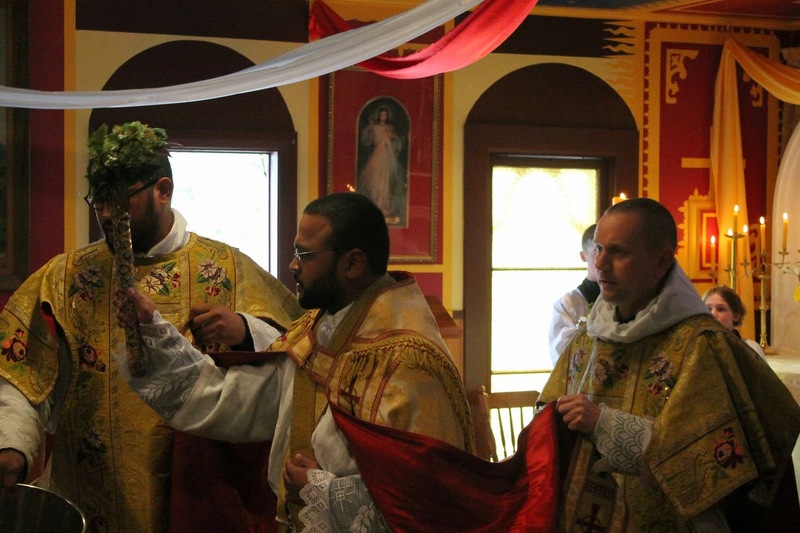 In a beautiful tradition, this linen band will be kept until the death of the new priest's mother, when it will be used to bind her hands when she is buried. 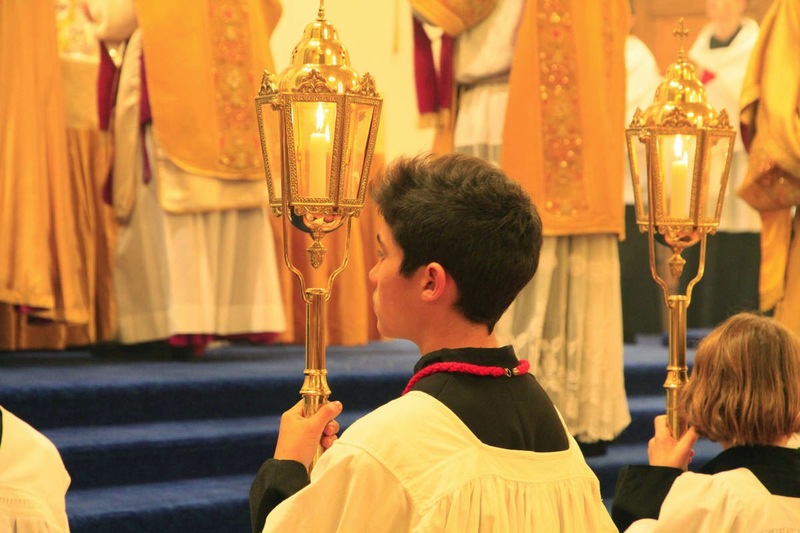 The tradition of the instruments: the chalice, paten and host are placed between Father's fingers. 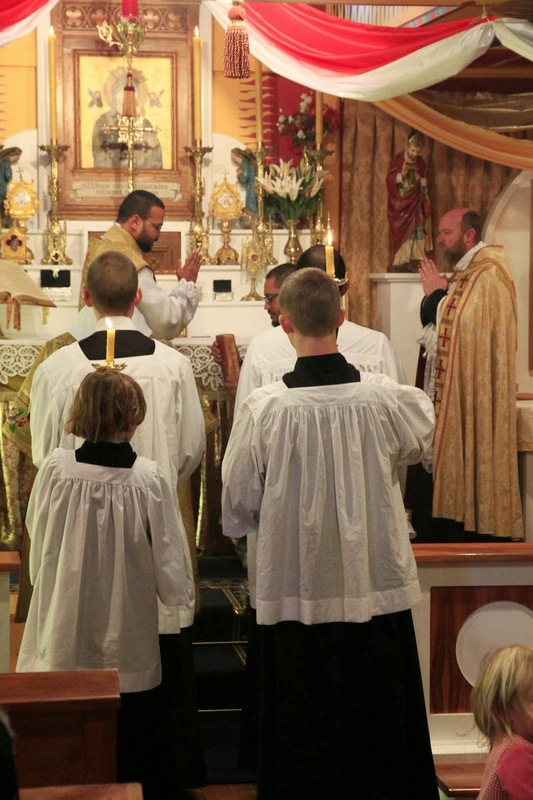 The Deacon chants the Gospel. 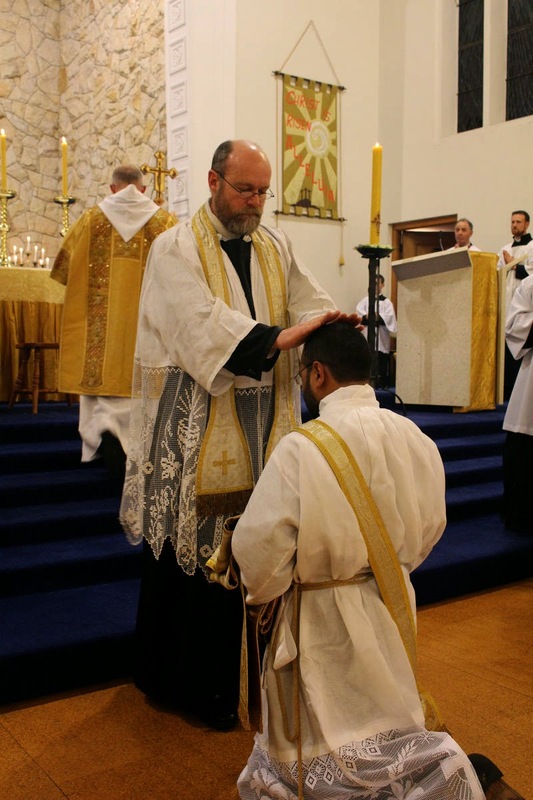 The Ordination of a priest is the only time that a priest concelebrates in the Extraordinary Form. 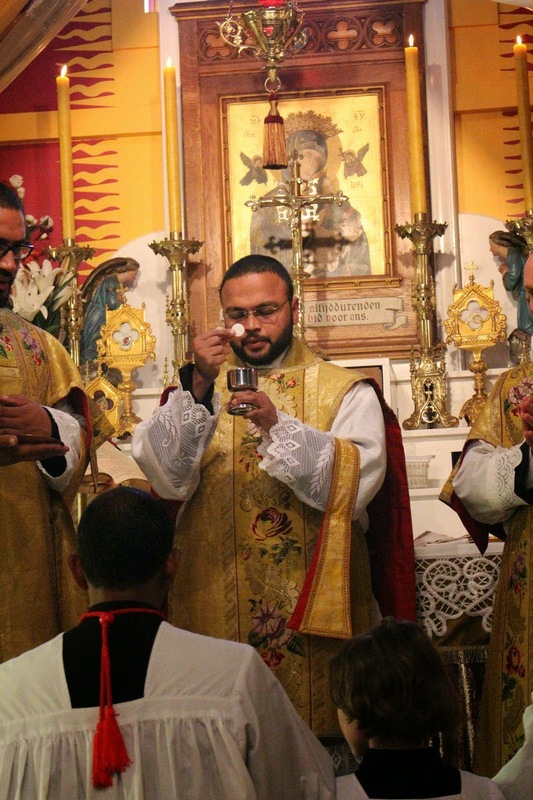 Here Fr Jean-Marie concelebrates the Holy Sacrifice with Bishop Meeking, while assisted by Very Rev Fr Anthony Mary, F.SS.R. 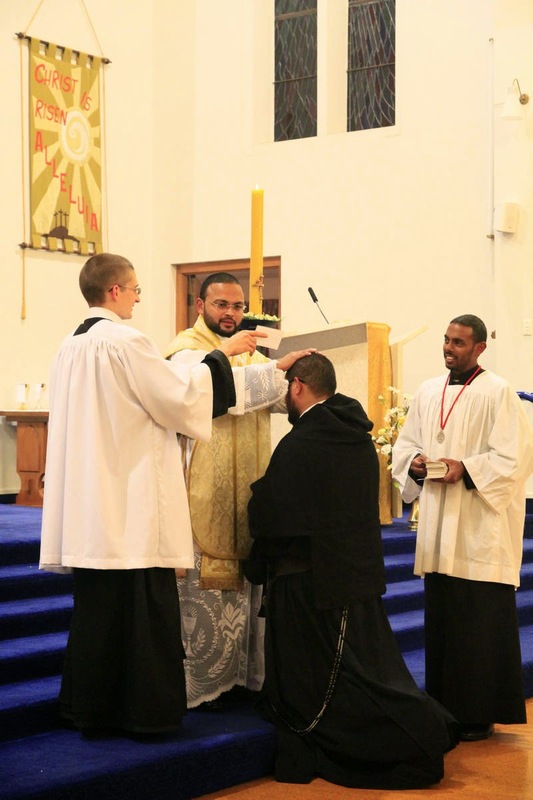 Fr Jean-Marie's ordination provided a great opportunity for many of the Latin Mass Chaplaincy's young men to serve on the altar. 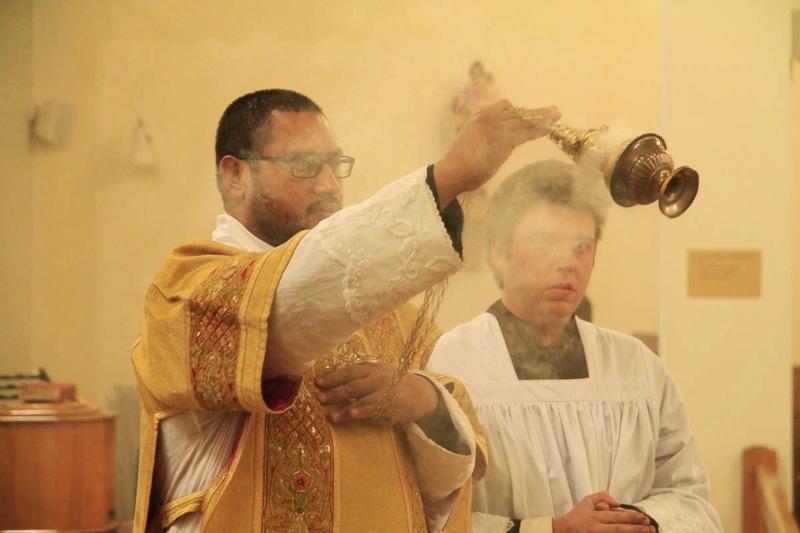 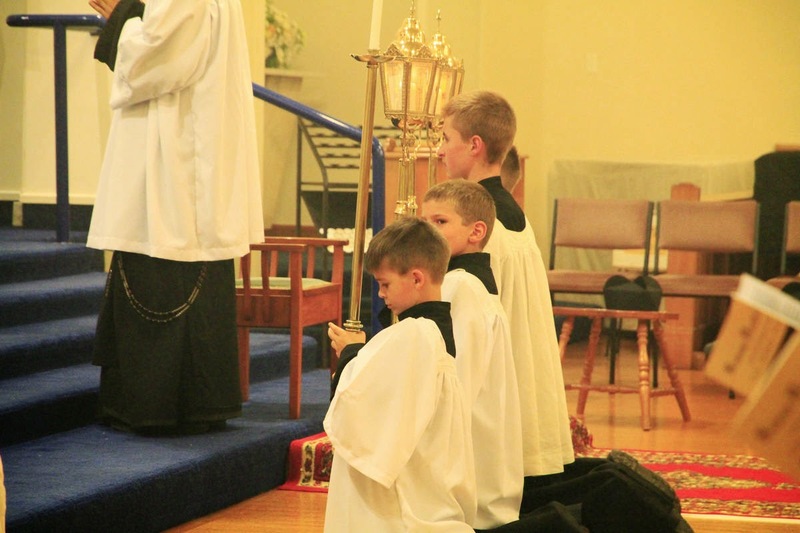 It is on occasions such as this that priestly vocations are born! 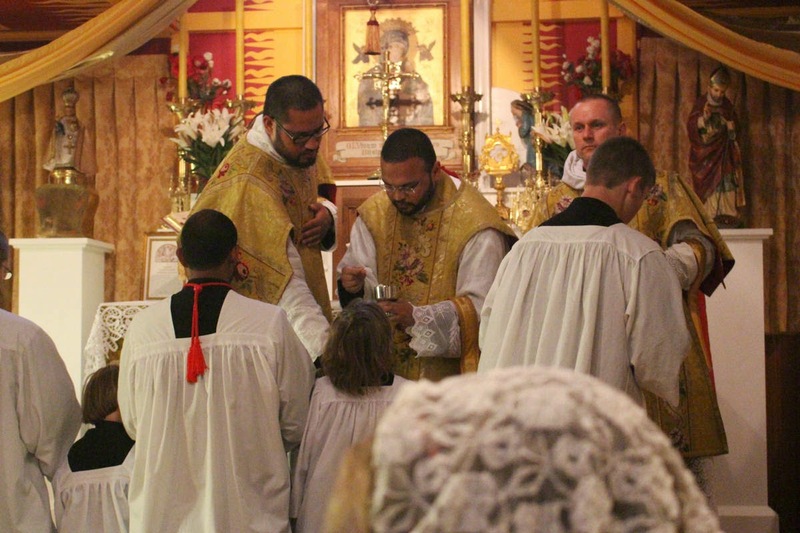 The bishop consumes the Sacred Body of Jesus Christ. 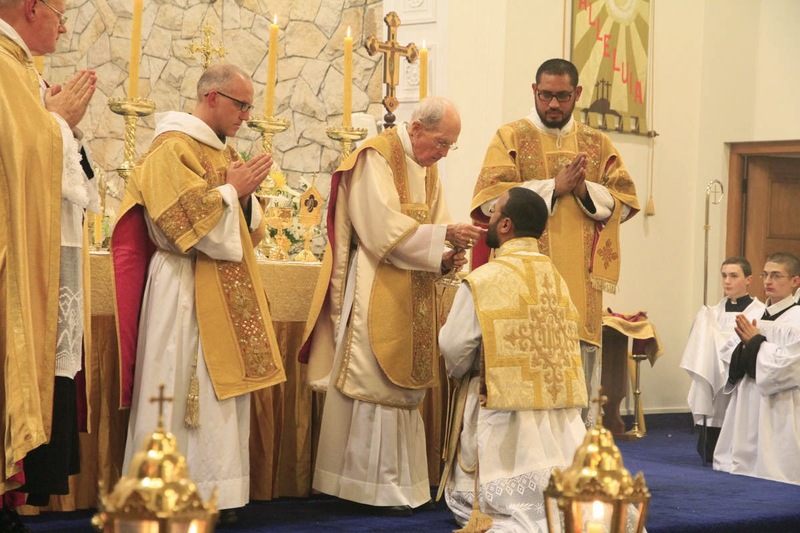 Fr Jean-Marie receives Holy Communion from the hands of Bishop Meeking. 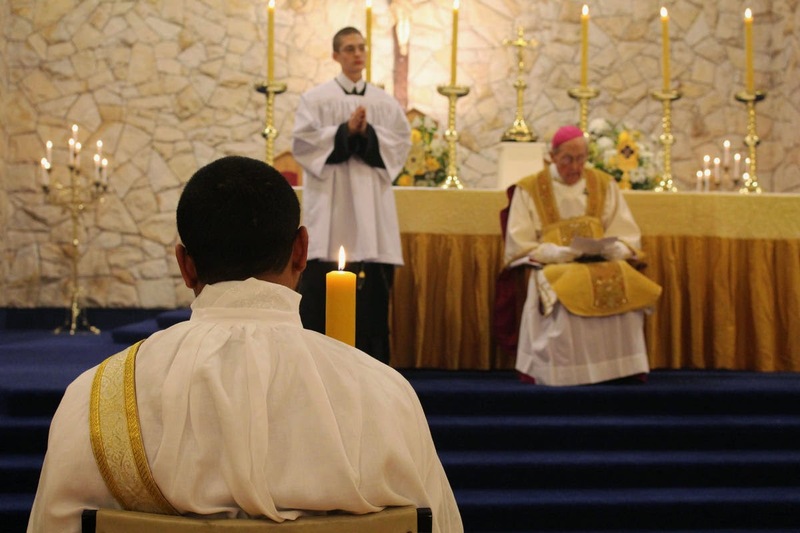 Leaving the ceremony a changed man. 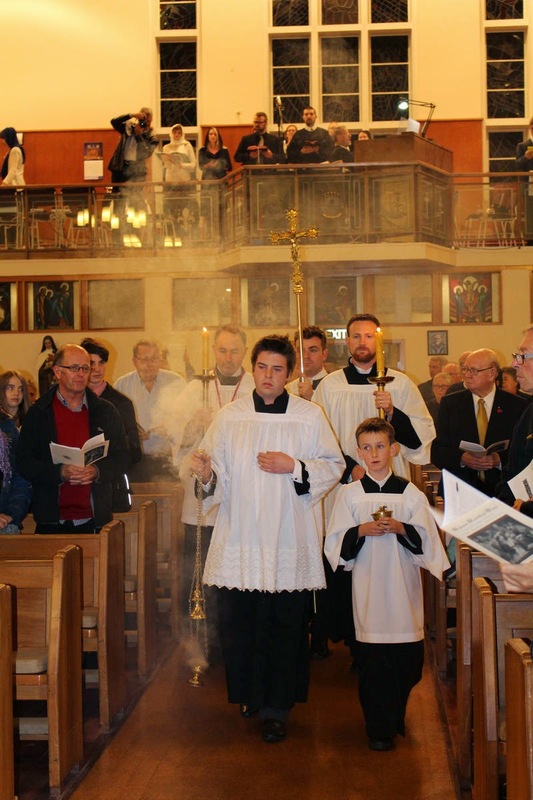 Now, whenever he wishes, Fr Jean-Marie may call God, and God will obey him, coming down from heaven into his consecrated hands. 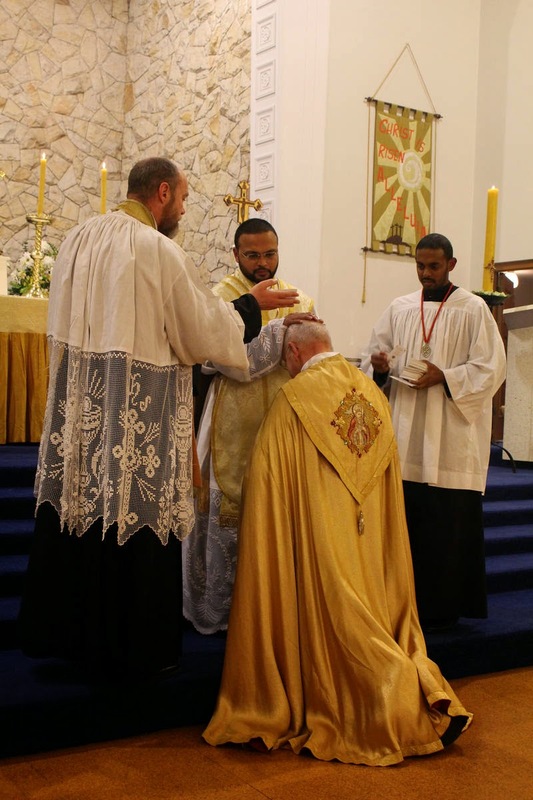 Fr Jean-Marie give his First Blessing to Bishop Meeking. 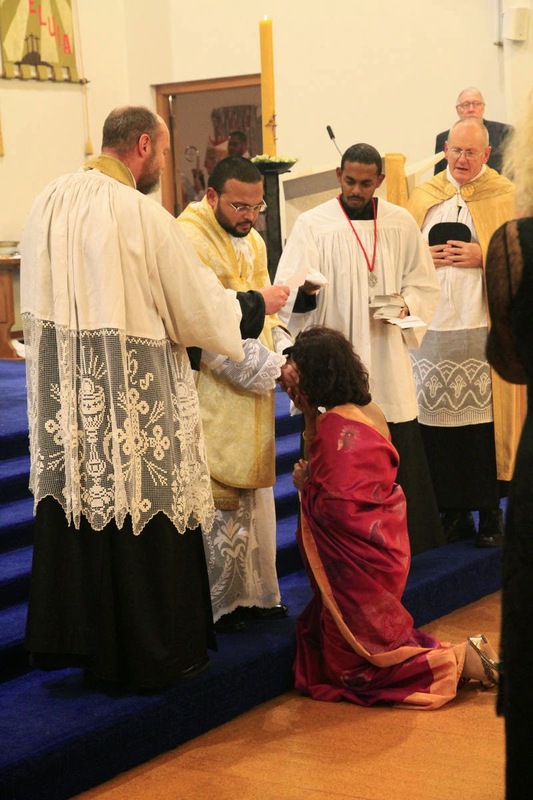 Fr Jean-Marie's mother kneels at the feet of her son to receive his First Blessing. 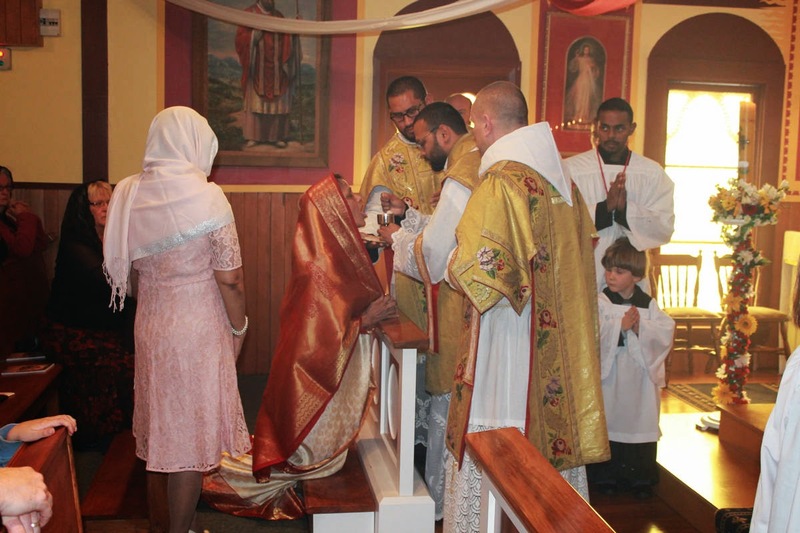 Father's Auntie receiving his blessing. 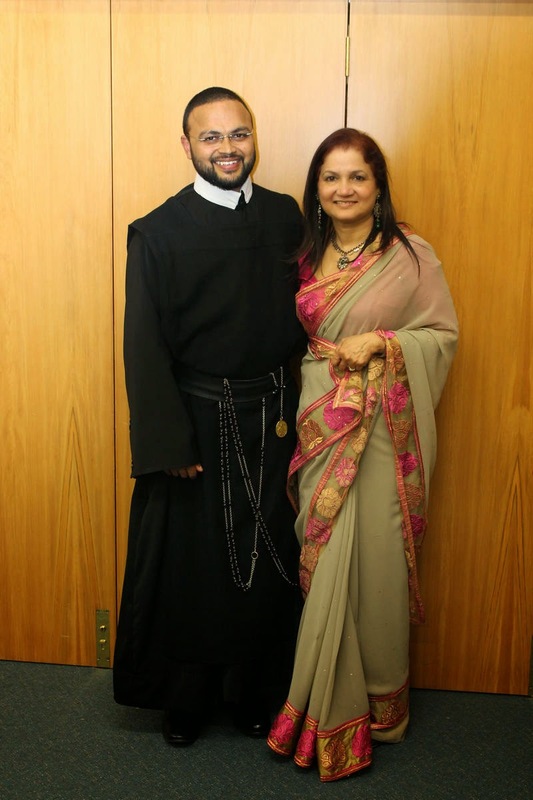 A son, and his proud Mother. 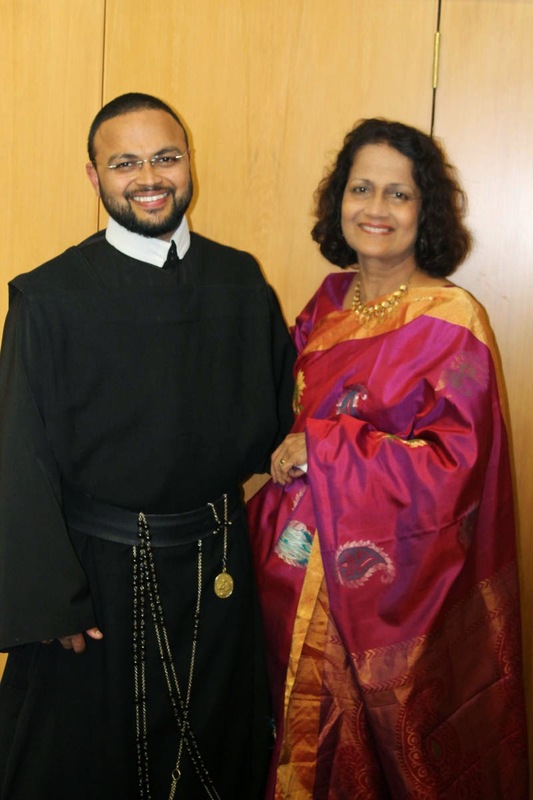 Fr Jean-Marie and his Auntie. 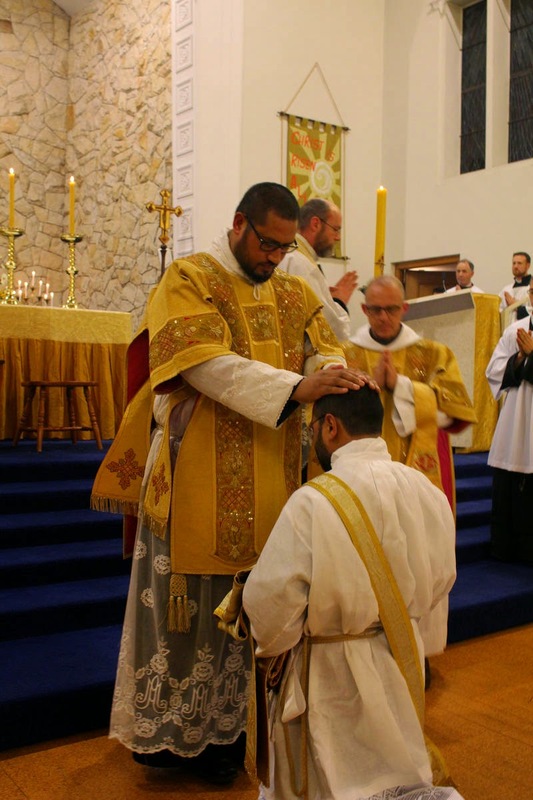 We thank God for this great grace of a new priest for our Congregation and for His Church!